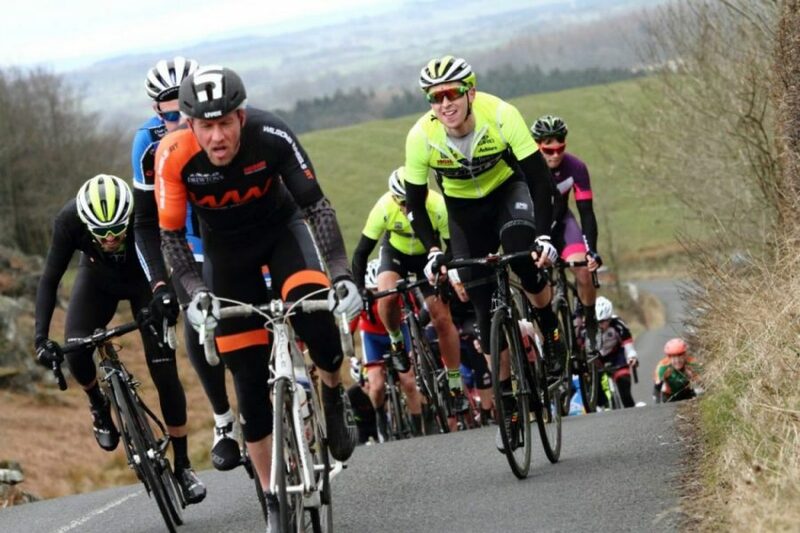 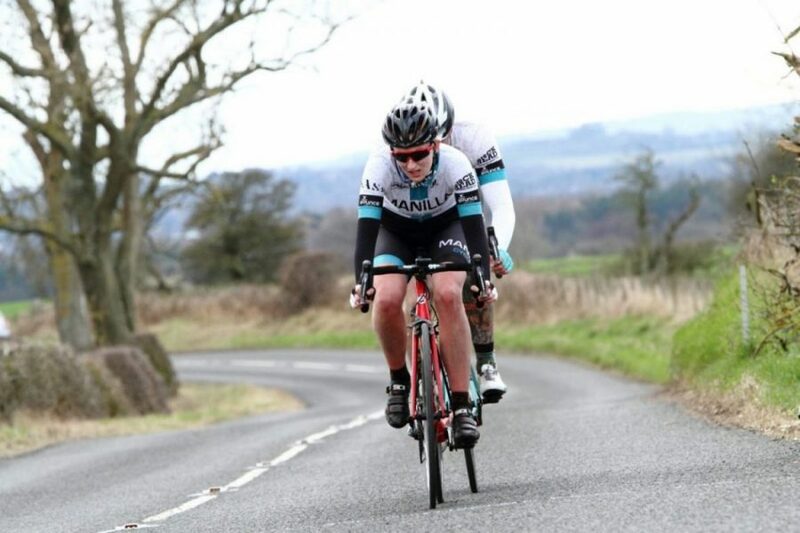 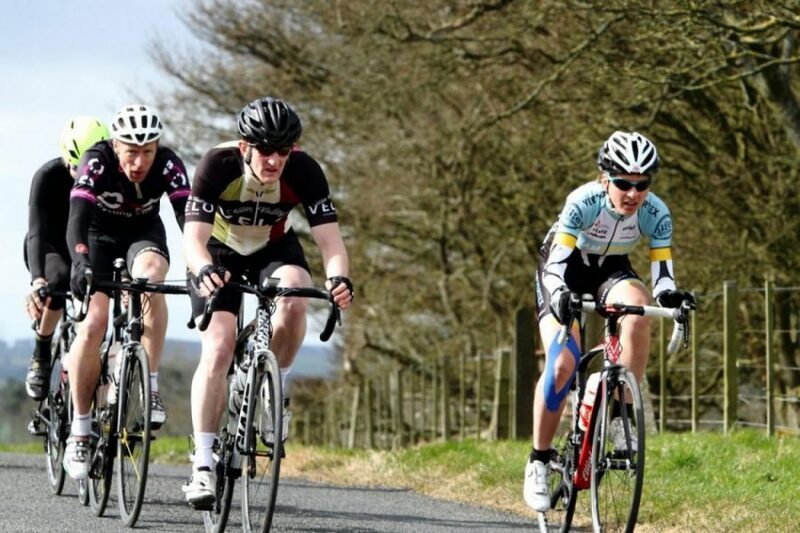 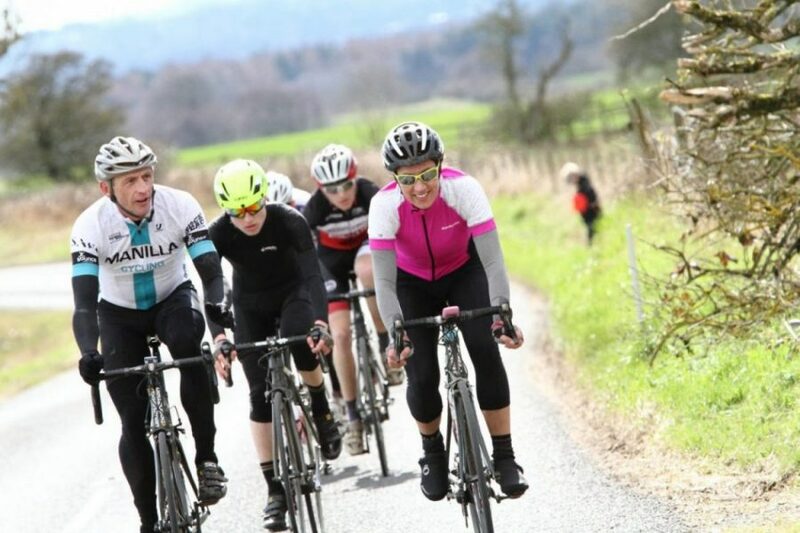 A cracking start on Easter Sunday for Fusion RT Fierlan’s Angela Hibbs at the MuleBar Tour of Northumberland 2016 Two Day event. 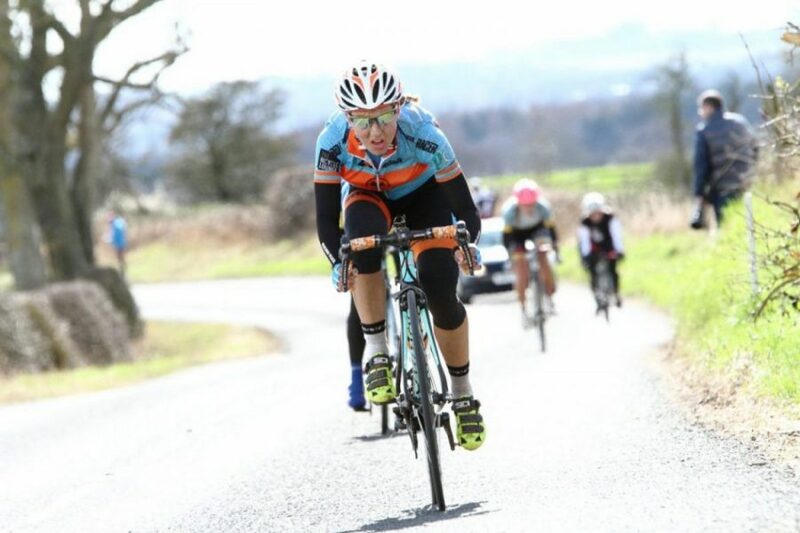 Sprinting up-to the line after a gruelling seventy-seven kilometre Circuit of Whalton four lap race. 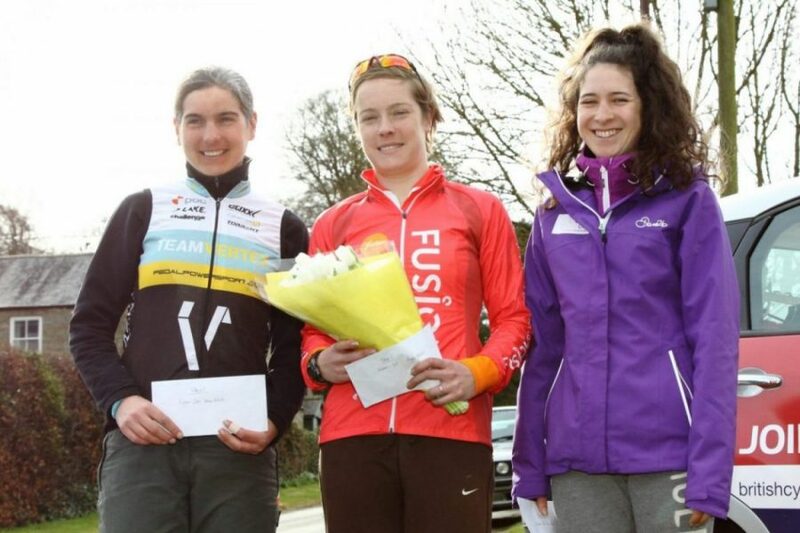 Angela had timed her effort to perfection to clinch the stage victory over Podium Ambition Pro Cycling p/b Club La Santa’s Amy Gornall and Team Vertex-pedalpowersport.com’s Karen Poole, picking up a five-second bonus too, with three for second and two for third. 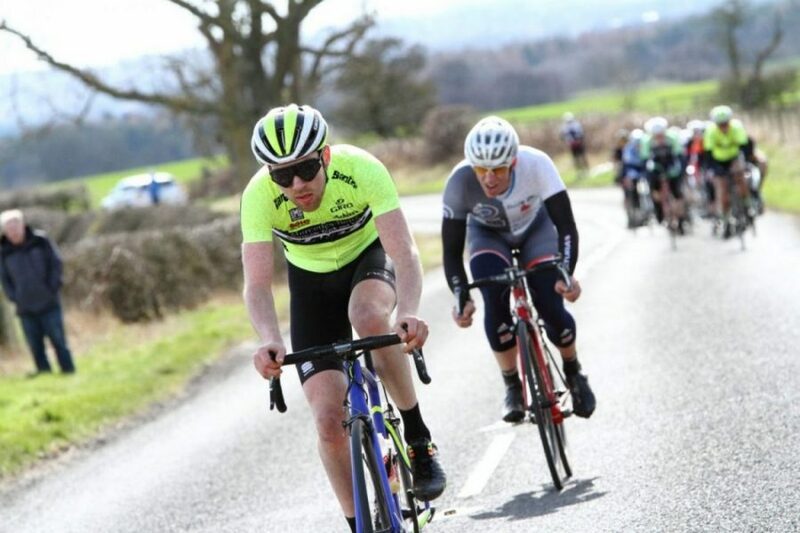 The blustery winds and threat of torrential downpours all added to the drama as the race un-folded. 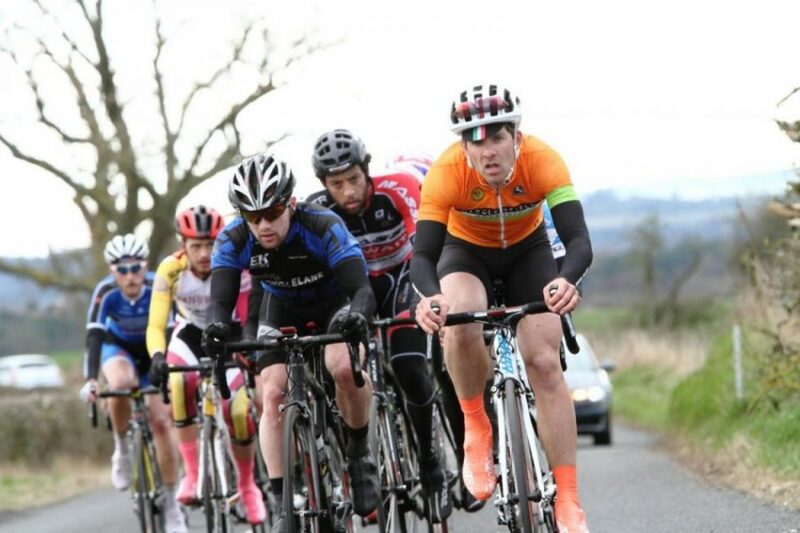 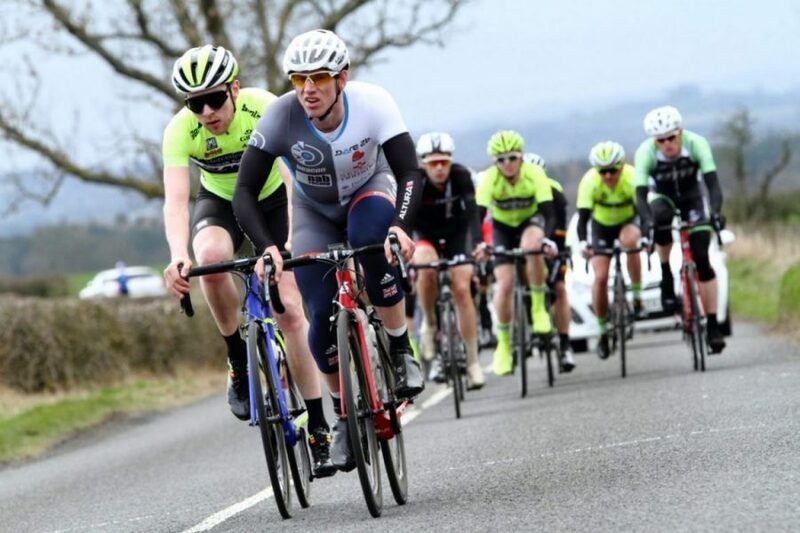 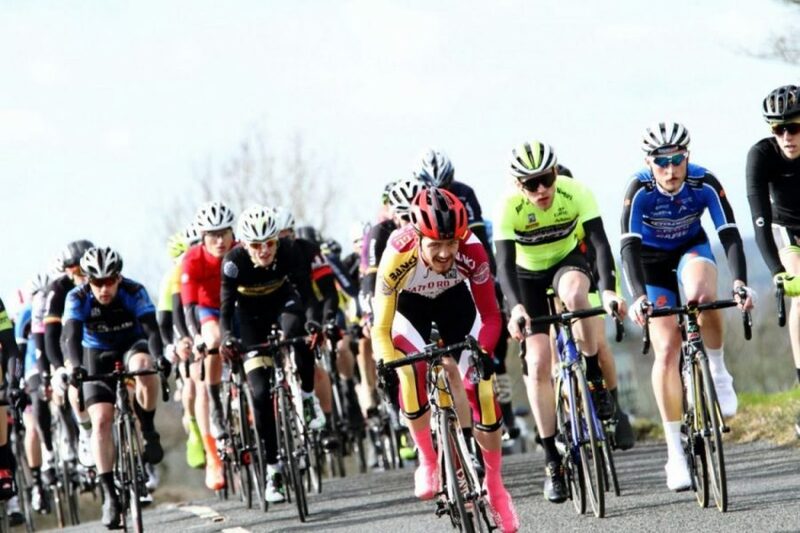 The race had set-off hard, but then brought to a halt a couple of miles after the official start that delayed the race for five minutes before re-starting neutralised. 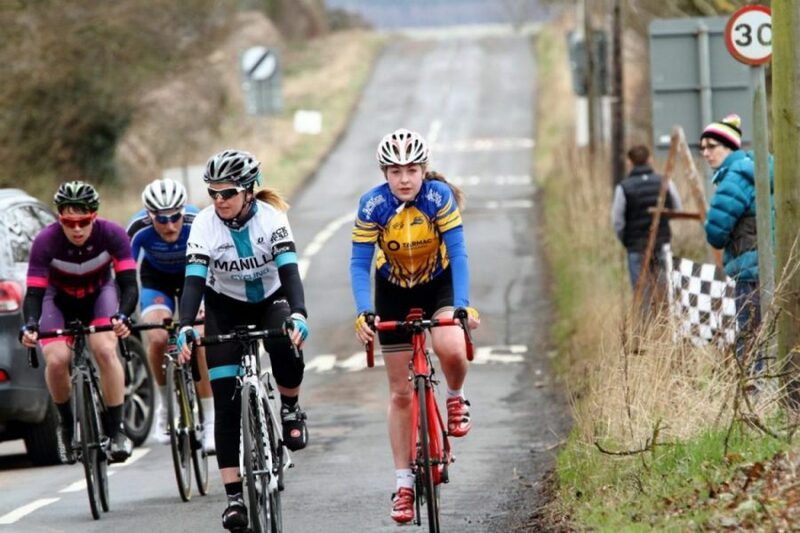 The women’s race had been incorporated with-in the third/fourth category race. 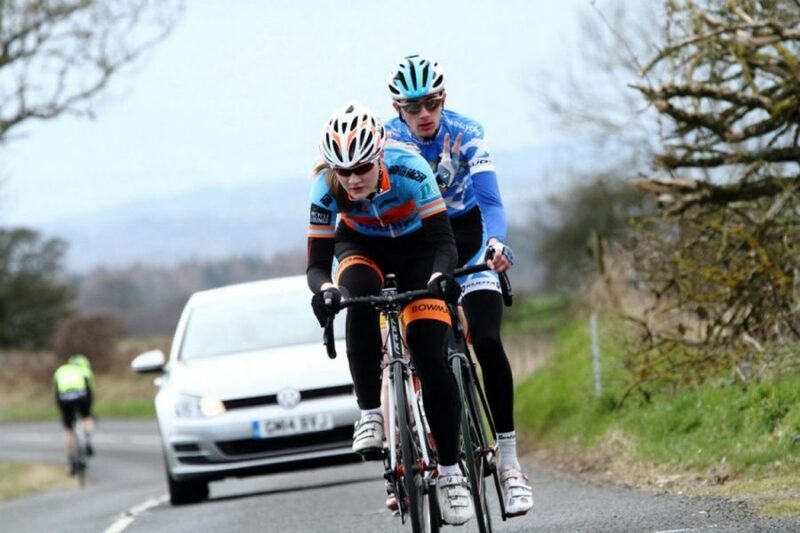 They set of again, but not as hard. 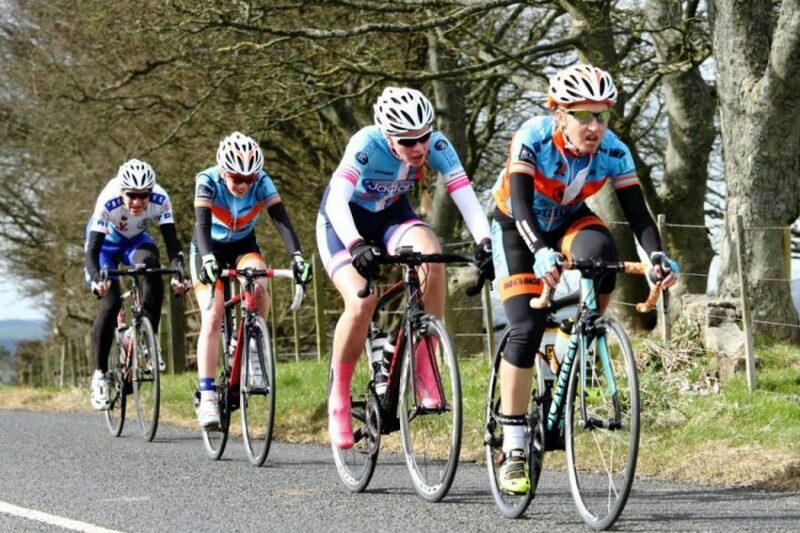 Once they went up the first drag the group split, leaving many of the third/ forth Cat lads and most of the women in little groups behind. 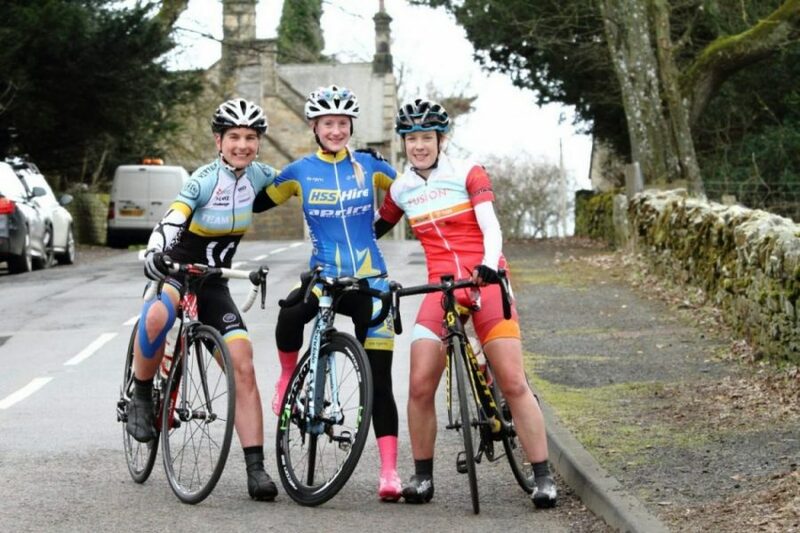 The trio of women rode the rest of their race in a group of around thirty, rolling through and helping to drive the peloton along. 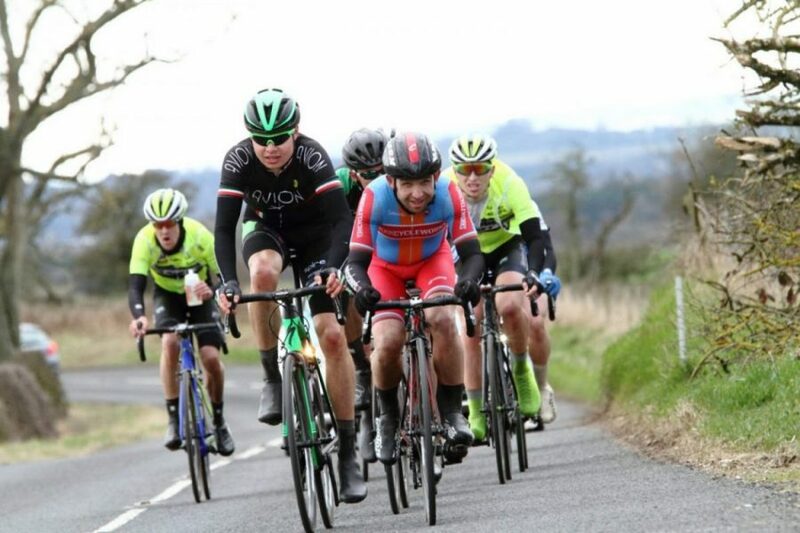 A couple of the lads went off the front of the group, but strong headwinds made it too difficult to try and bridge any gap alone. 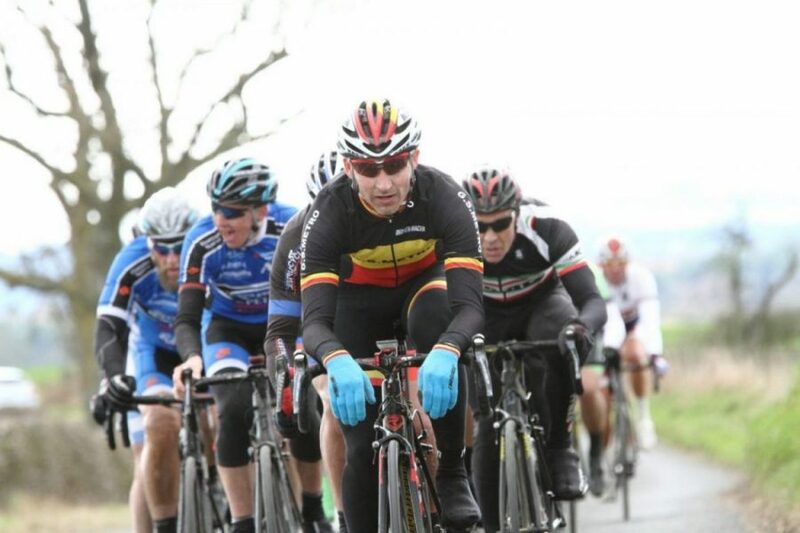 So stayed in the shelter of the main group. 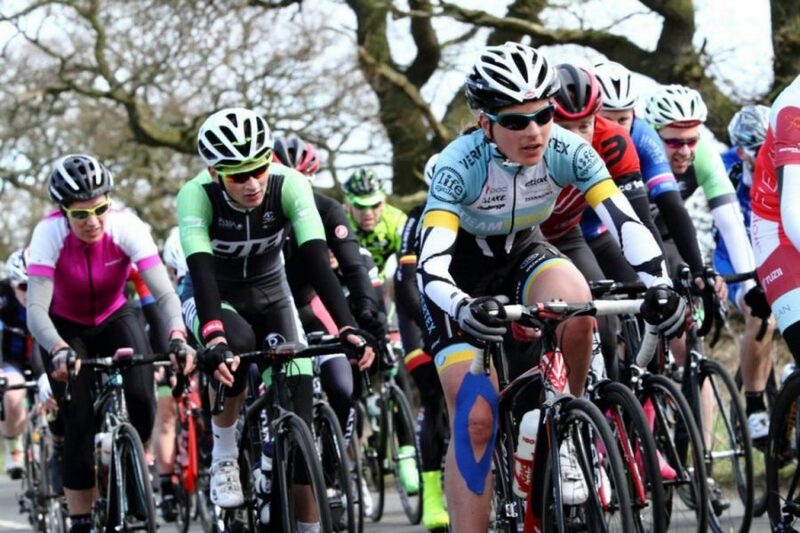 As the final kilometre approached, the women were allowed to contest their finish and they looked at each other before Angela set about her final charge to the line. 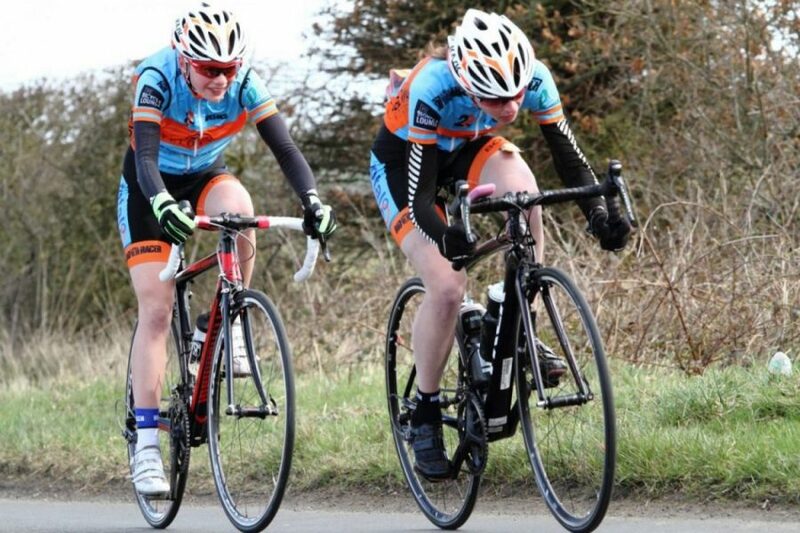 Amy and Karen were close behind, but didn’t have the power to reel her back-in. 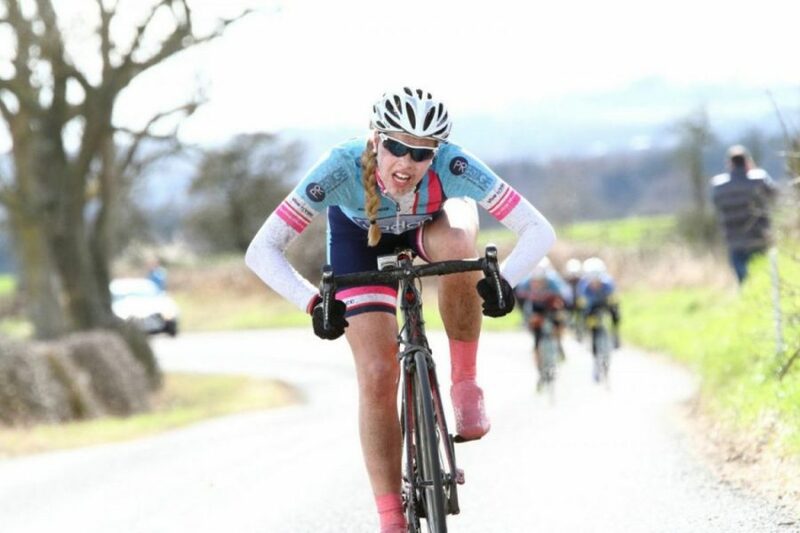 Angela Hibbs “With half a lap to go two guys went on the attack so I went with them. 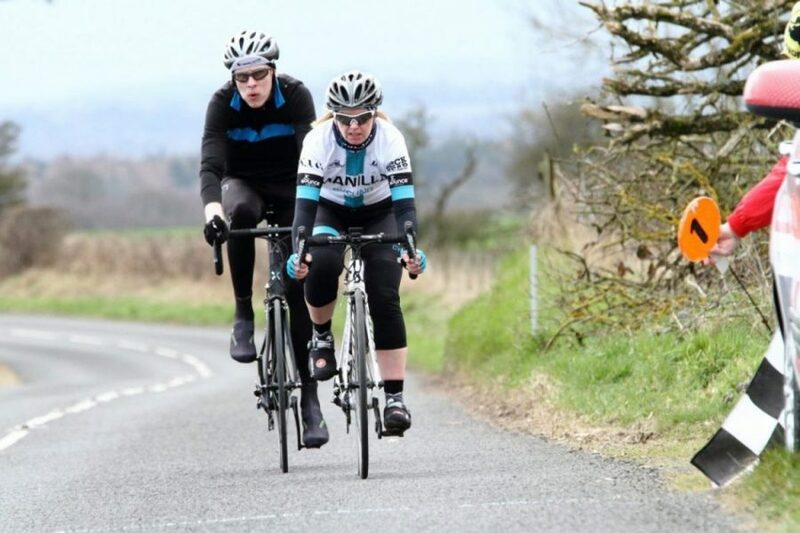 Then they sat-up and I though ahh! 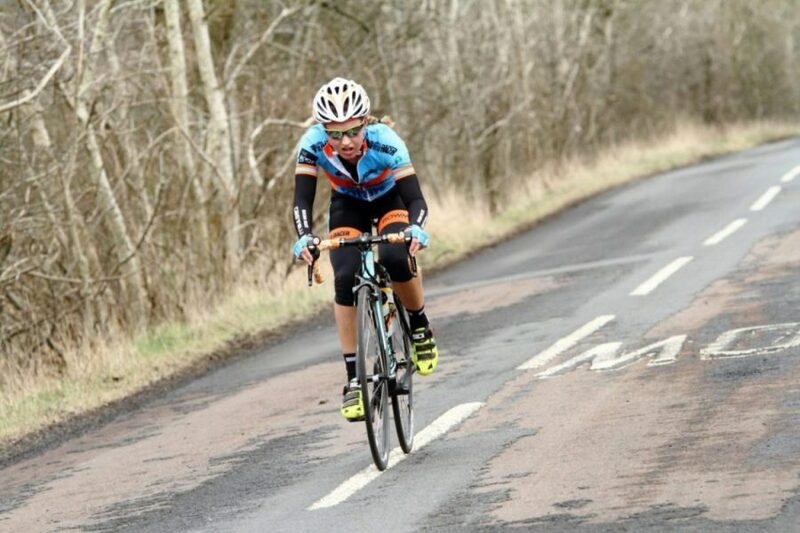 I kept going. 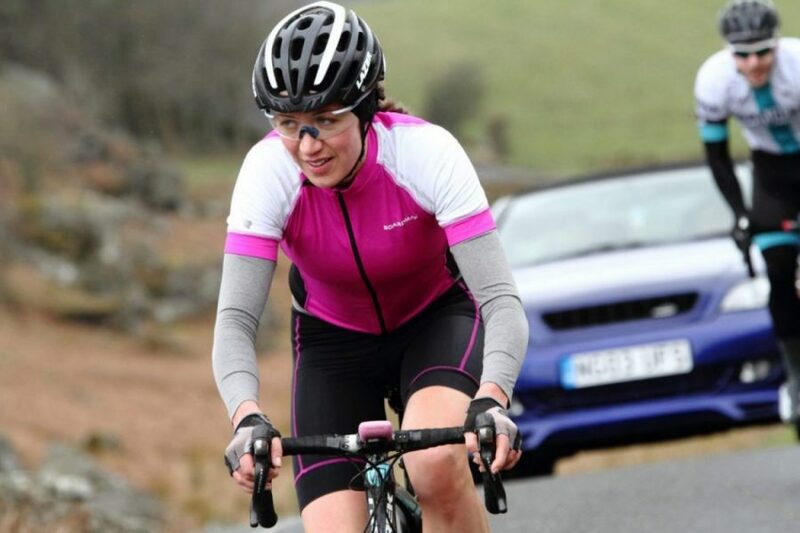 When I looked behind, they were on my wheel dragging Amy and Karen along”. 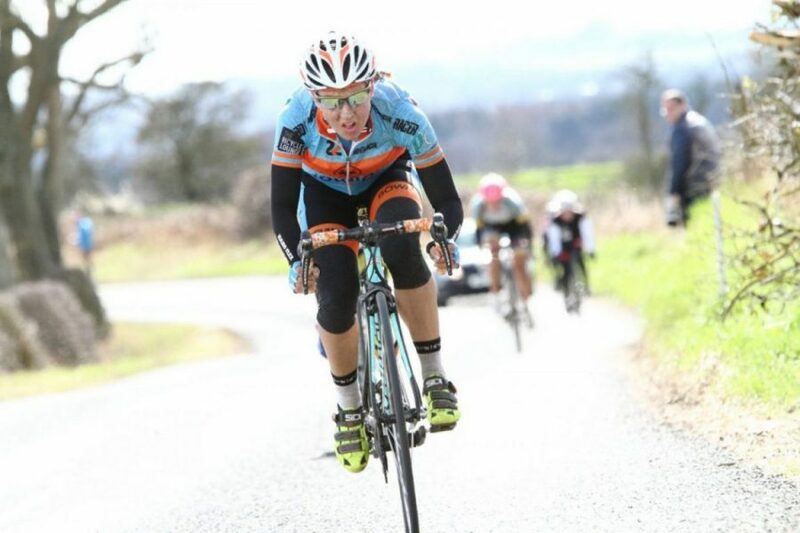 The guys were asked hang back and let the Women contest their race unimpeded on the final run up-to the finish line. 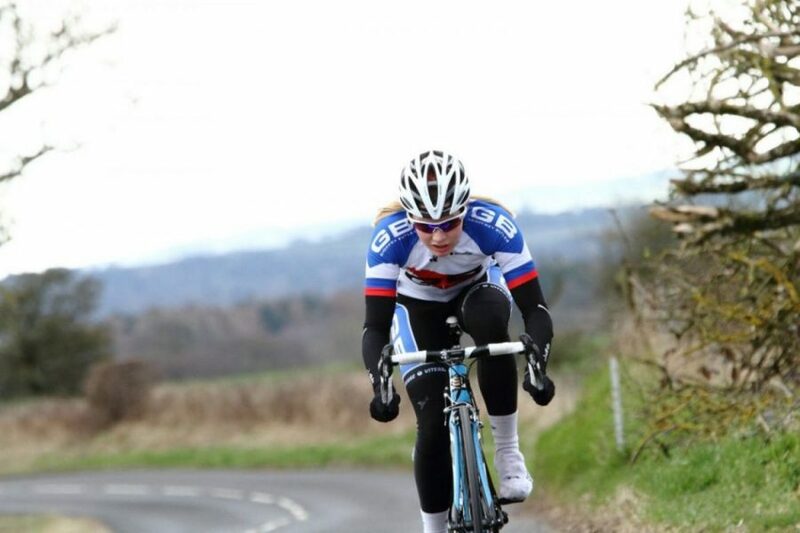 “I didn’t want it to come down to a sprint, I wanted to avoid that at all costs! 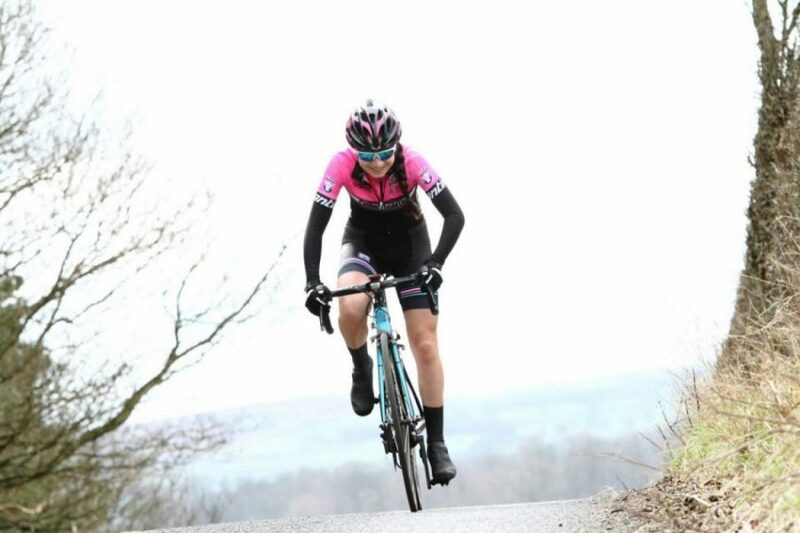 I just kept the pace high and the power high”, I got to the farm and just upped the pace and the power and hoped they wouldn’t come around”. 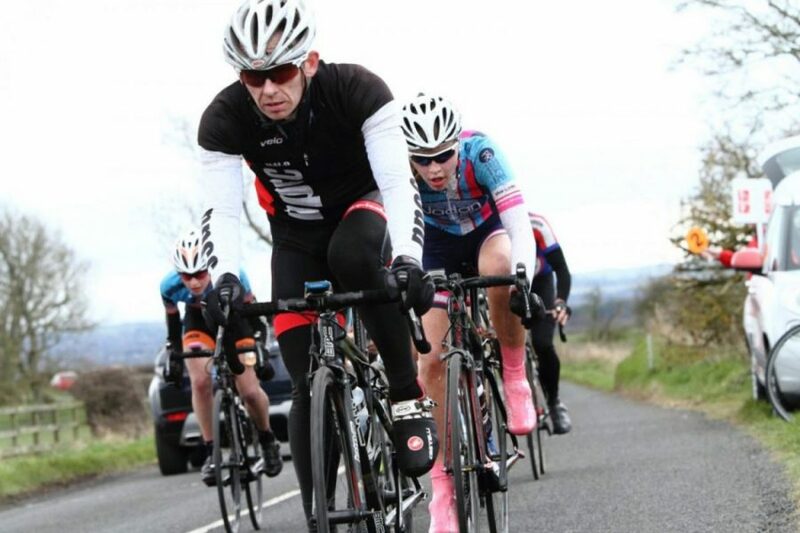 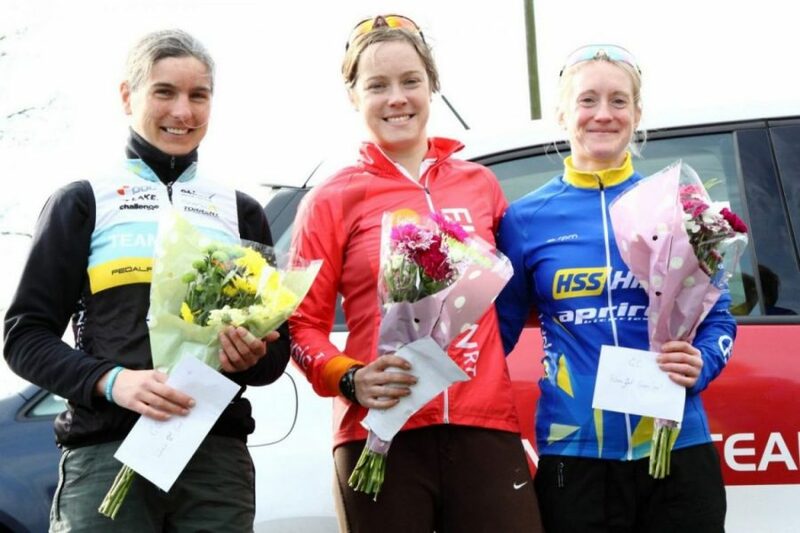 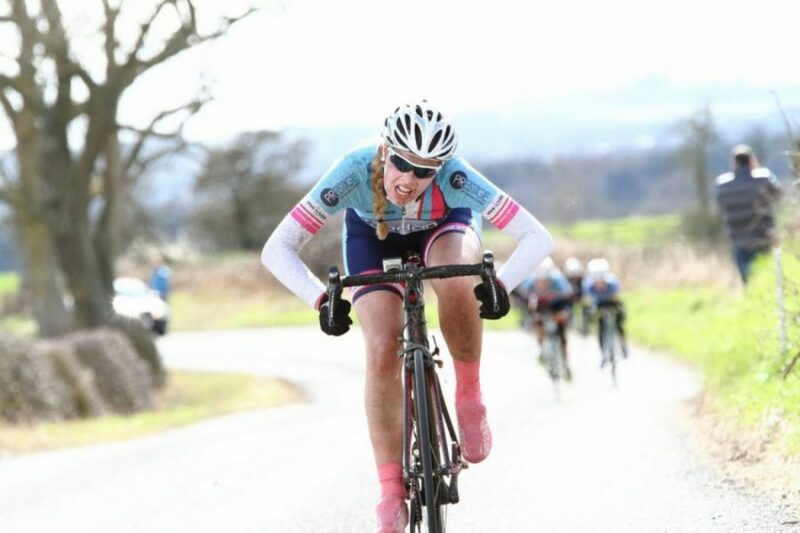 A double win gives Fusion RT Fierlan’s Angela Hibb the General Classification Victory in the MuleBar Tour of Northumberland 2016. 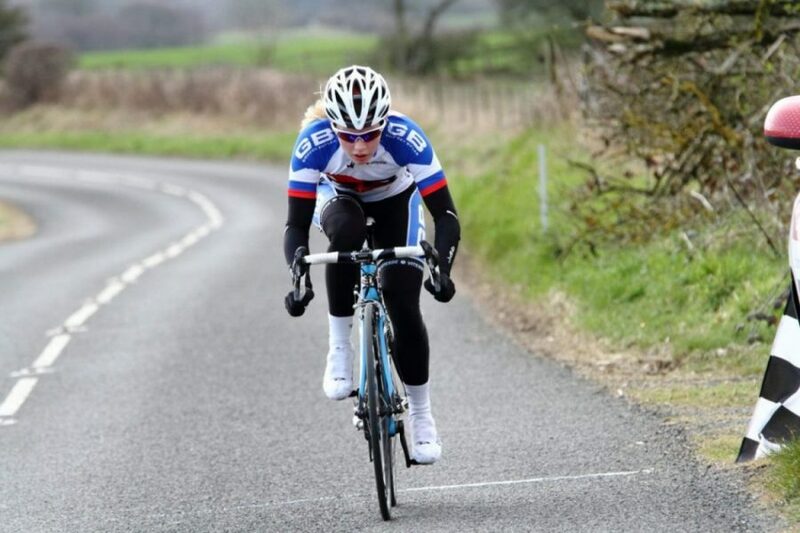 Riding safely within the main bunch on this testing course in the wind, Angela set her plan in motion and executing her move perfectly to add momentum to her early season programme. 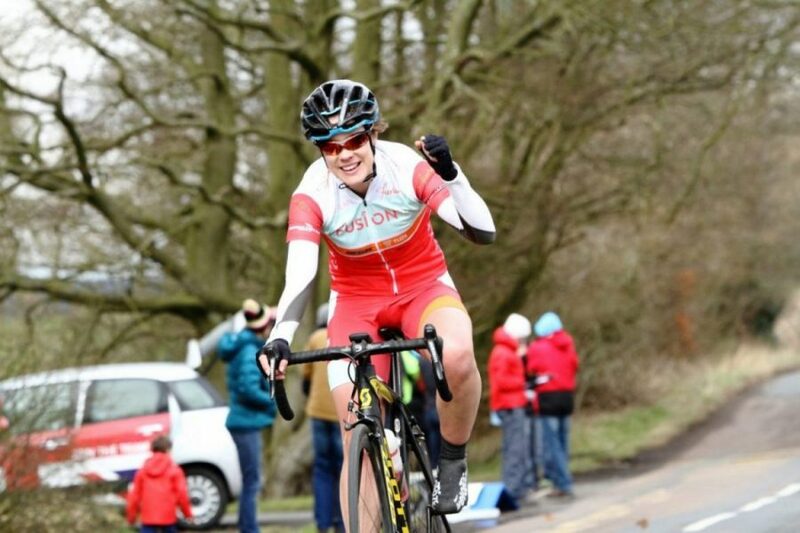 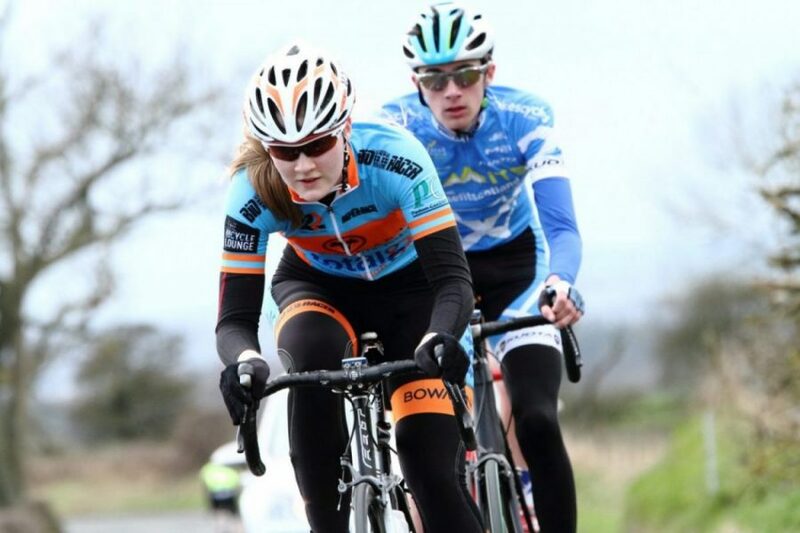 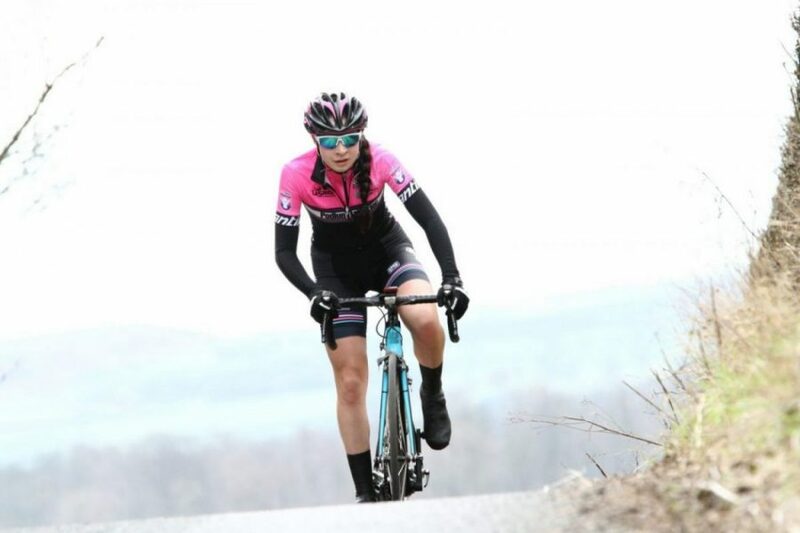 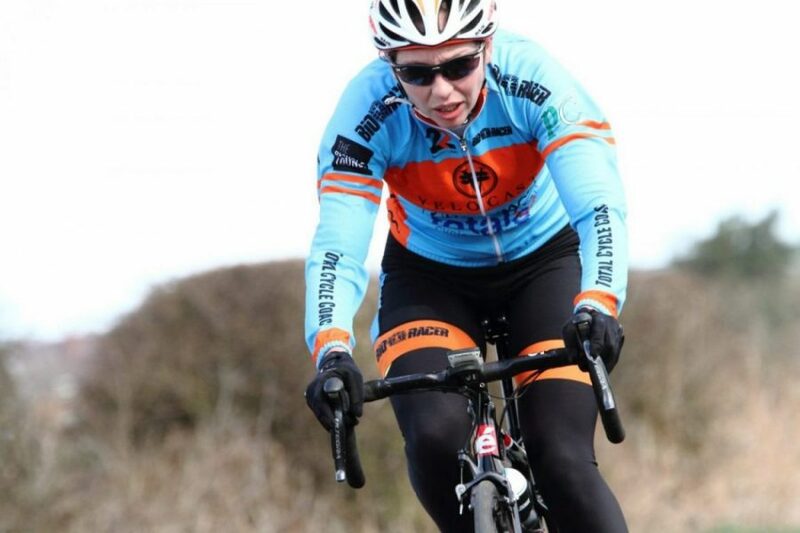 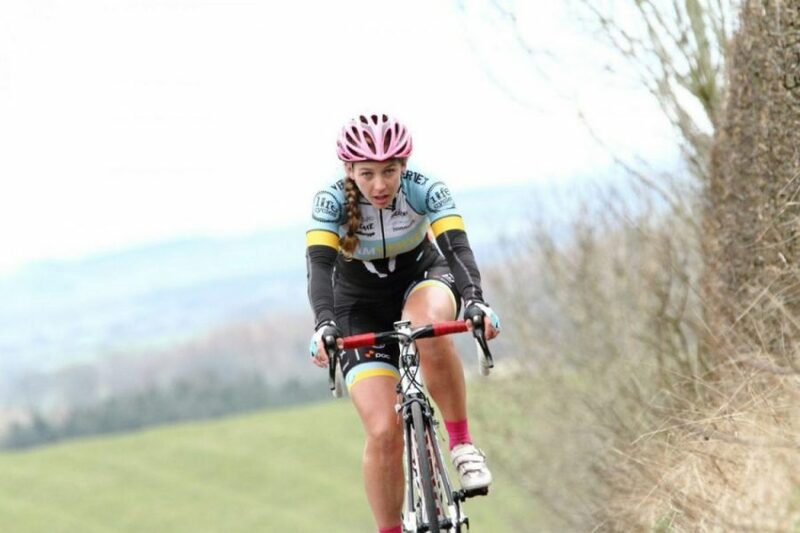 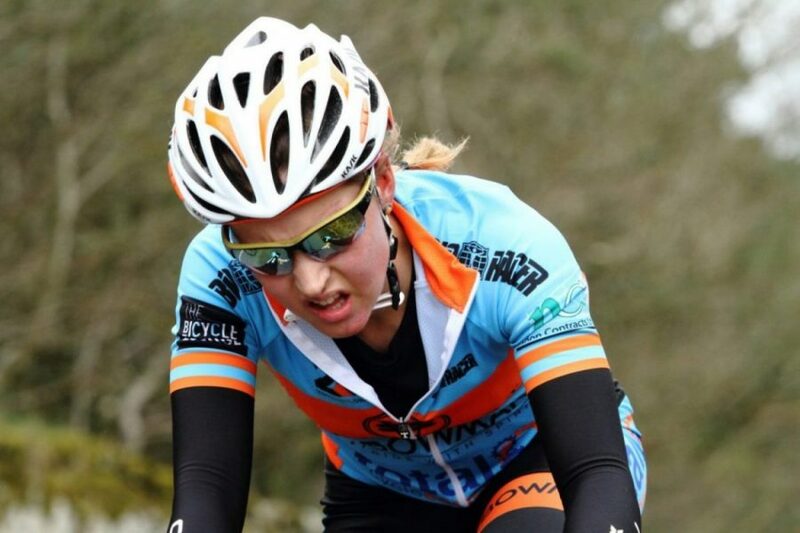 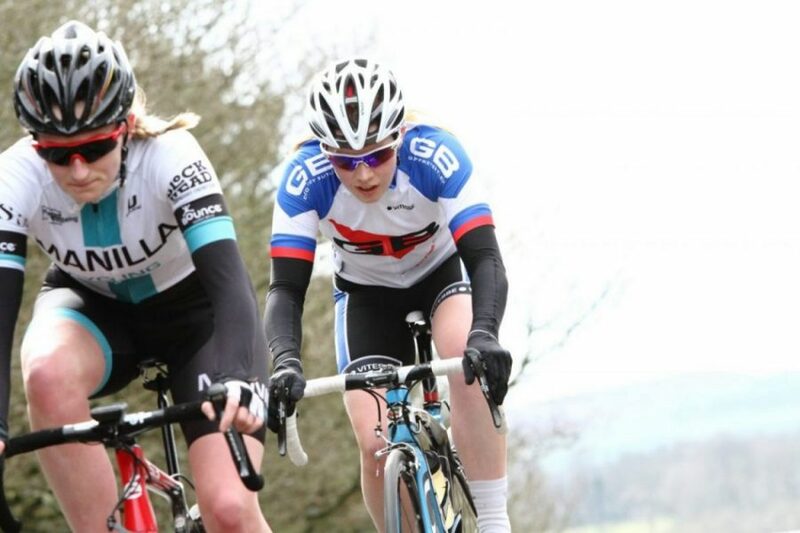 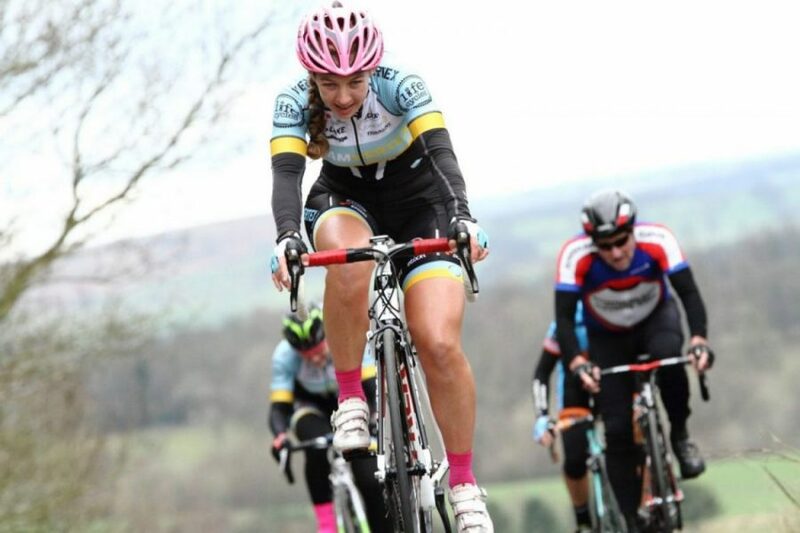 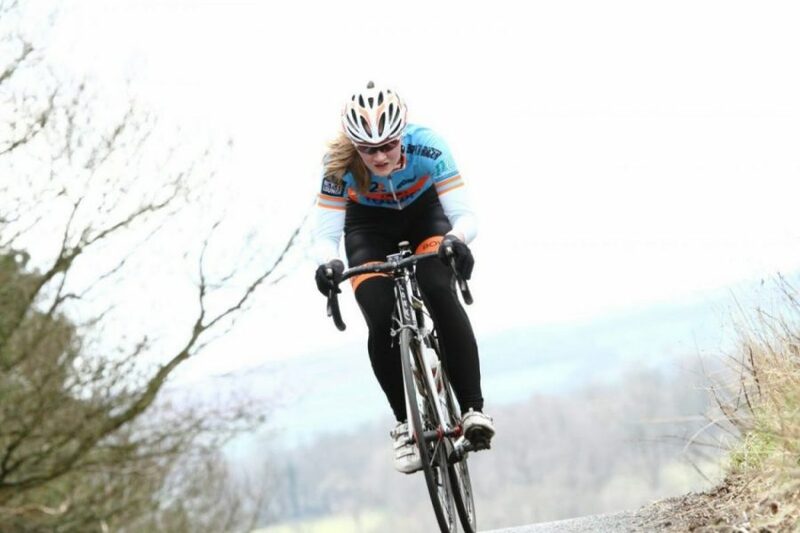 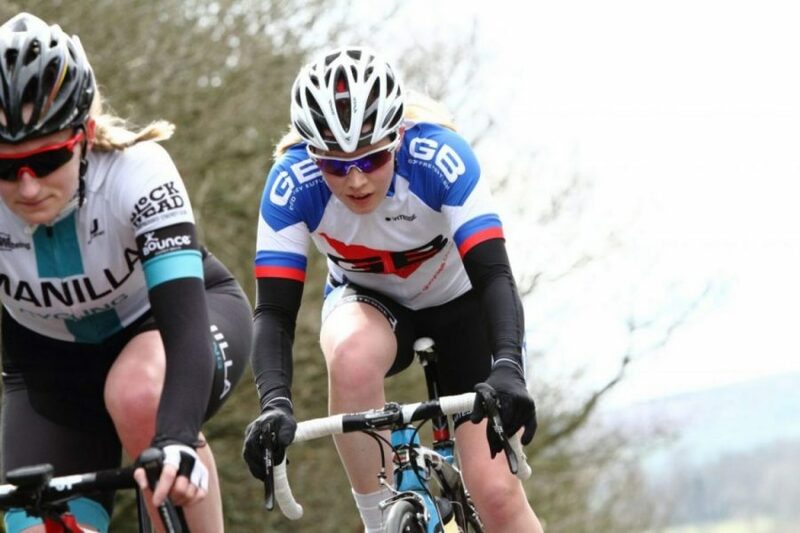 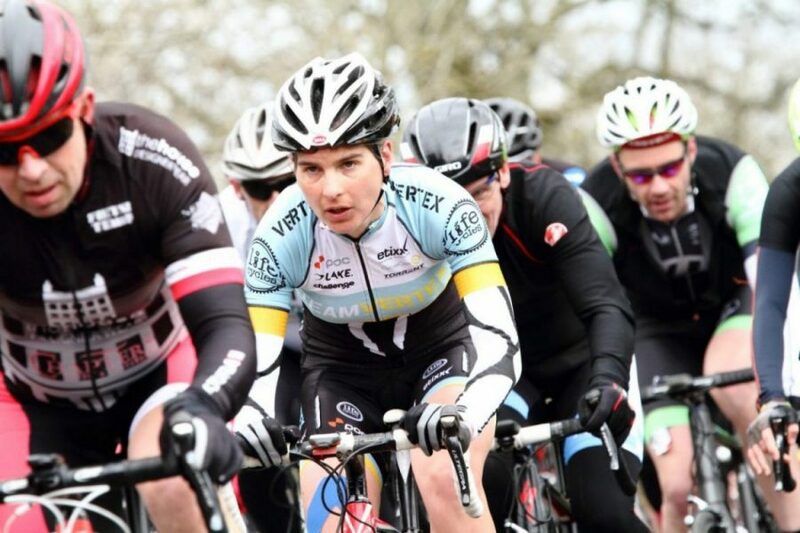 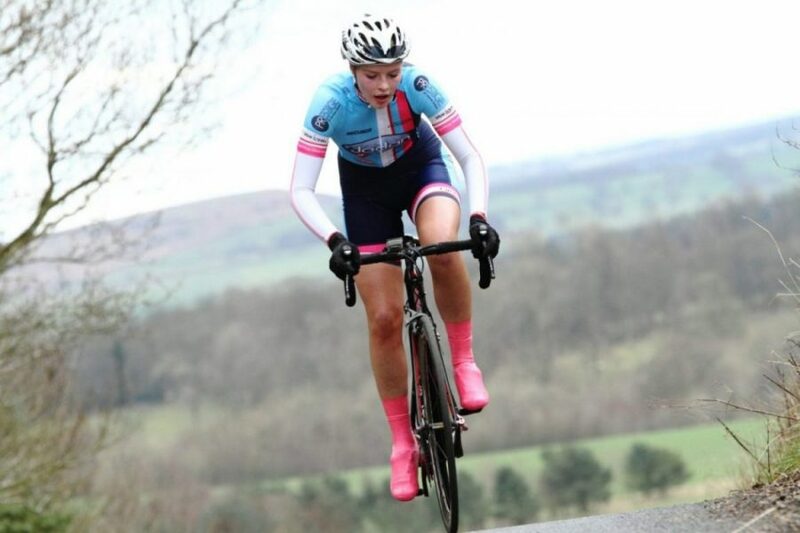 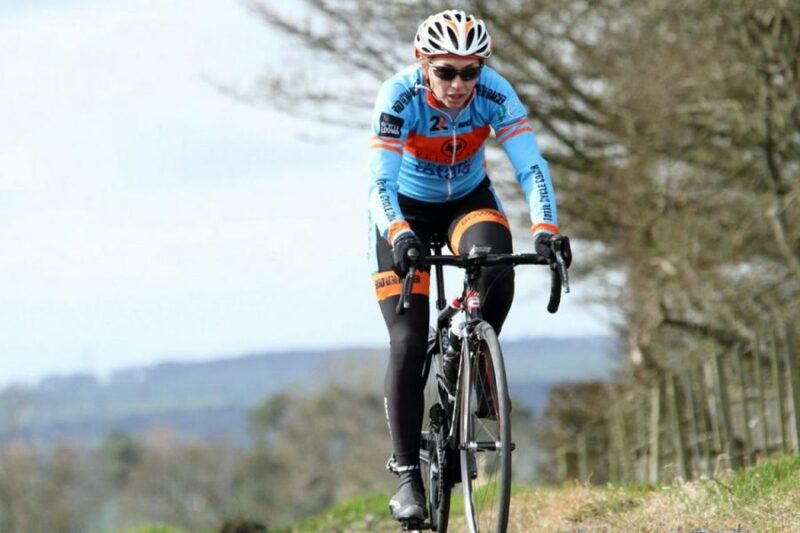 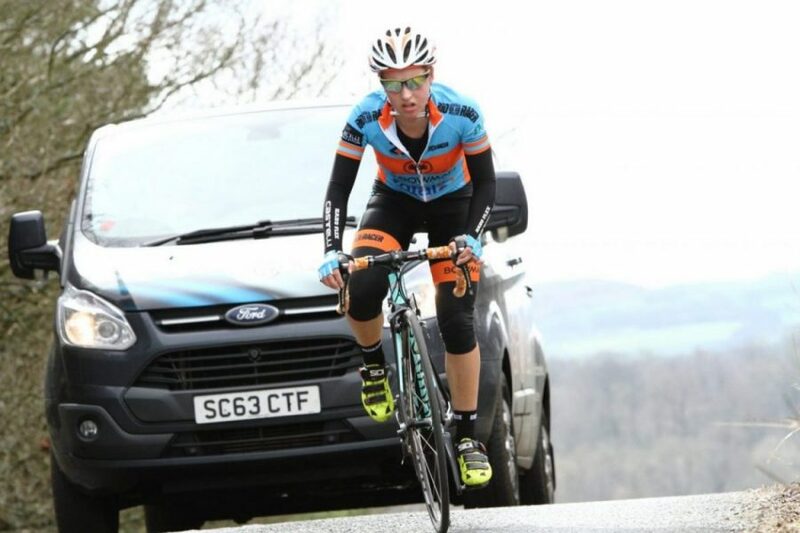 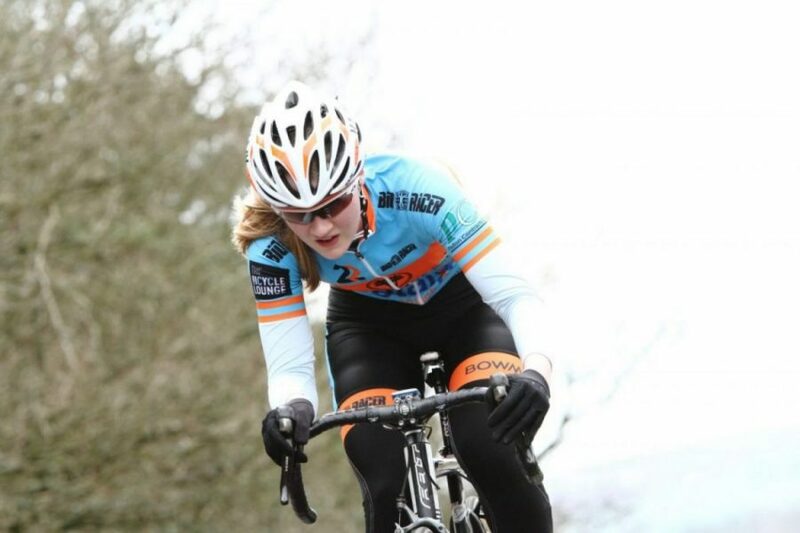 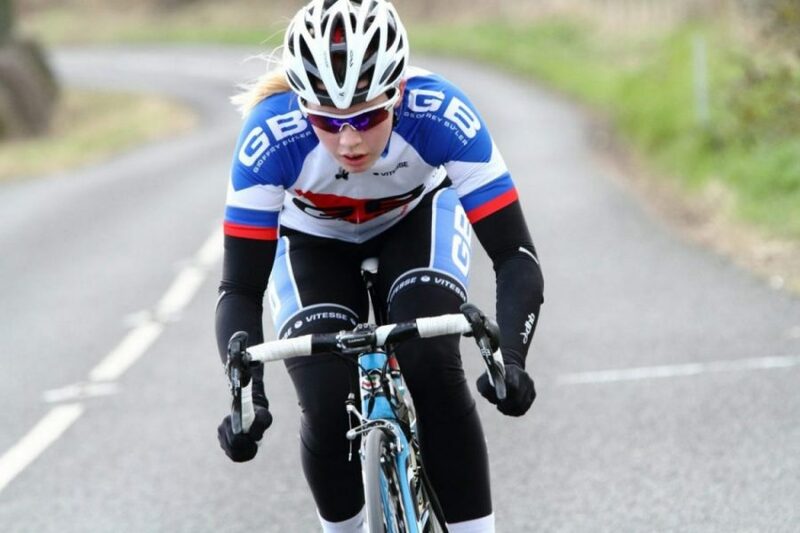 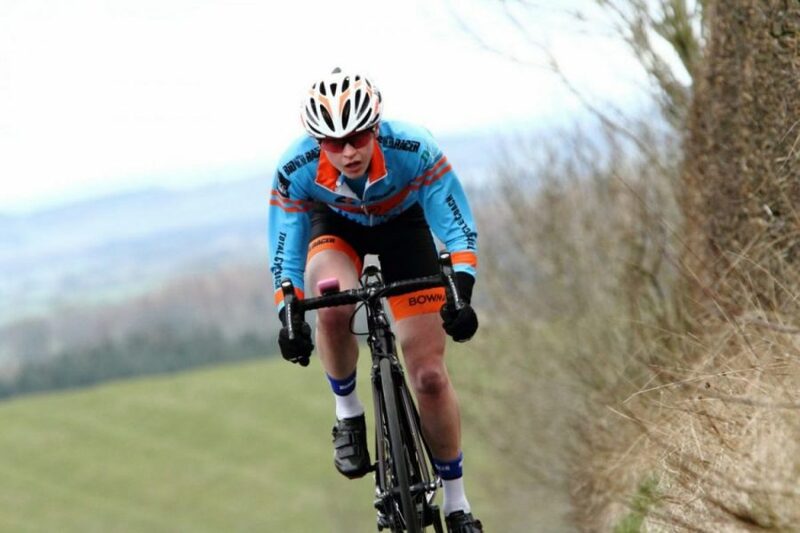 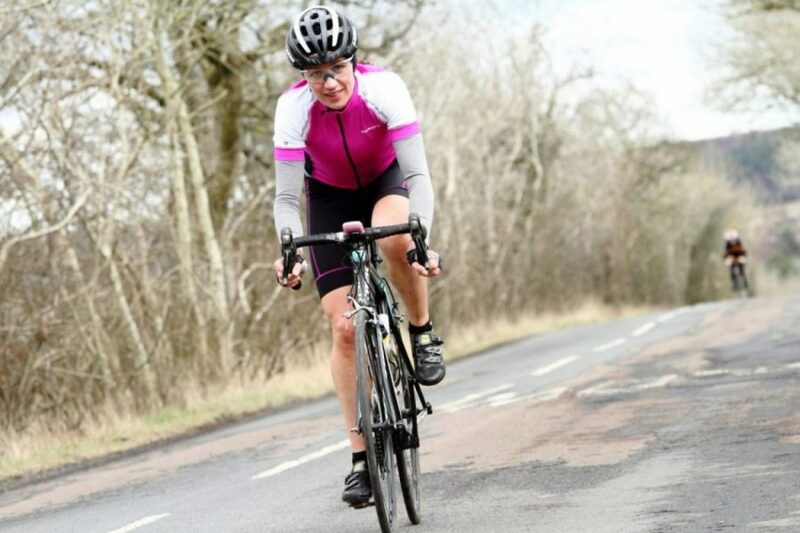 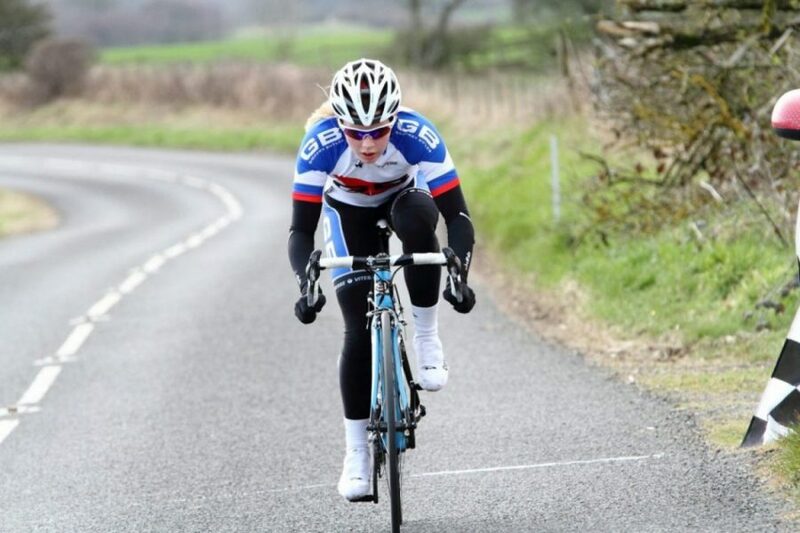 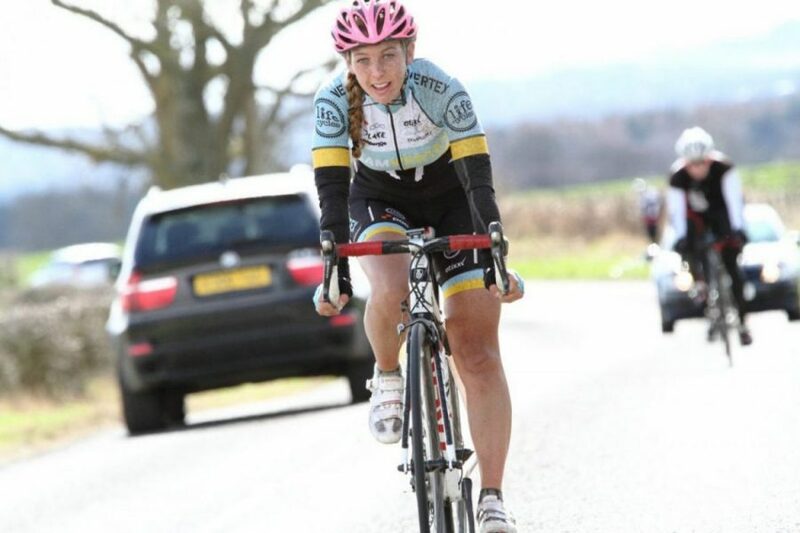 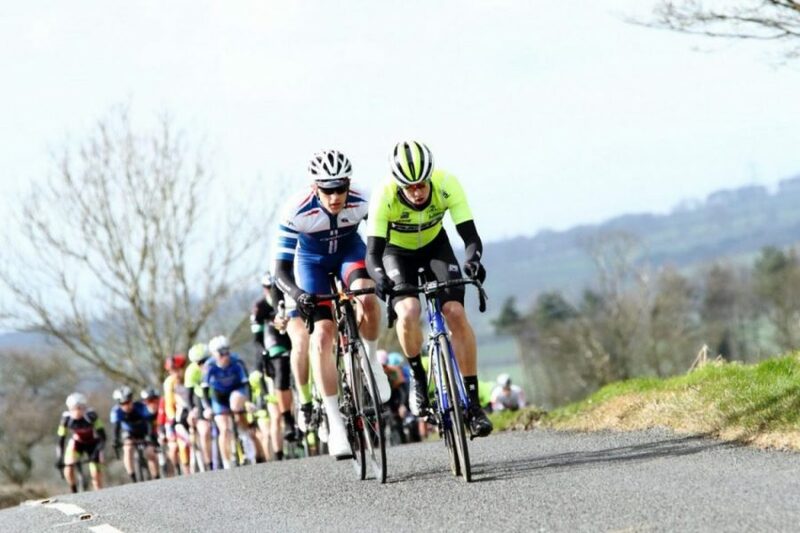 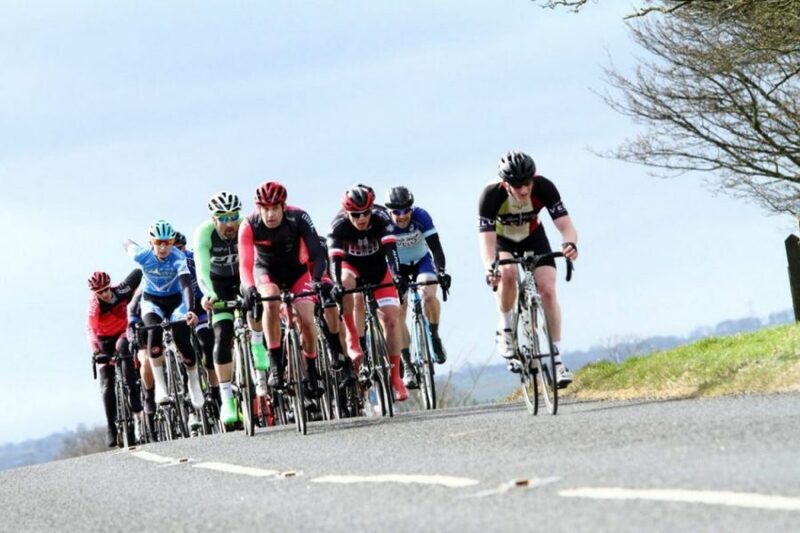 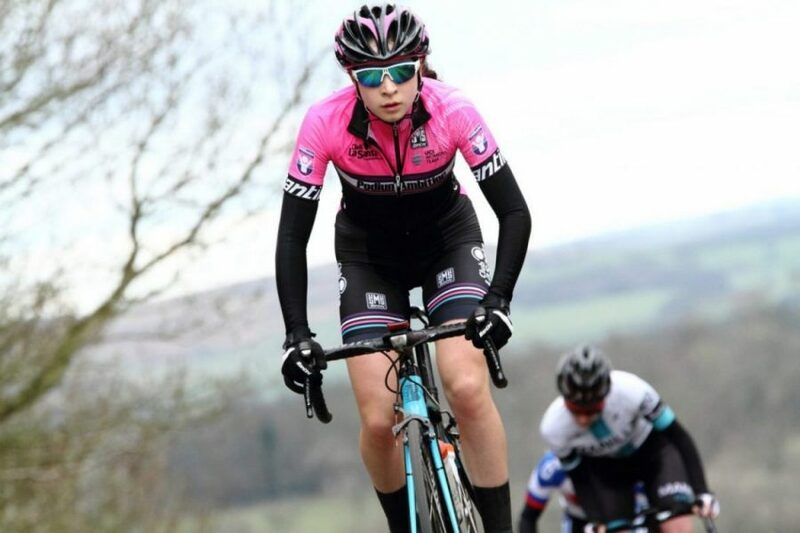 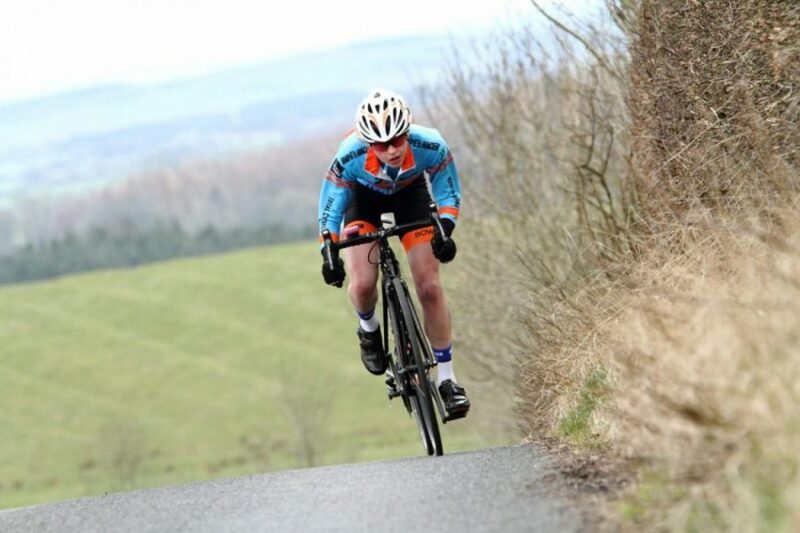 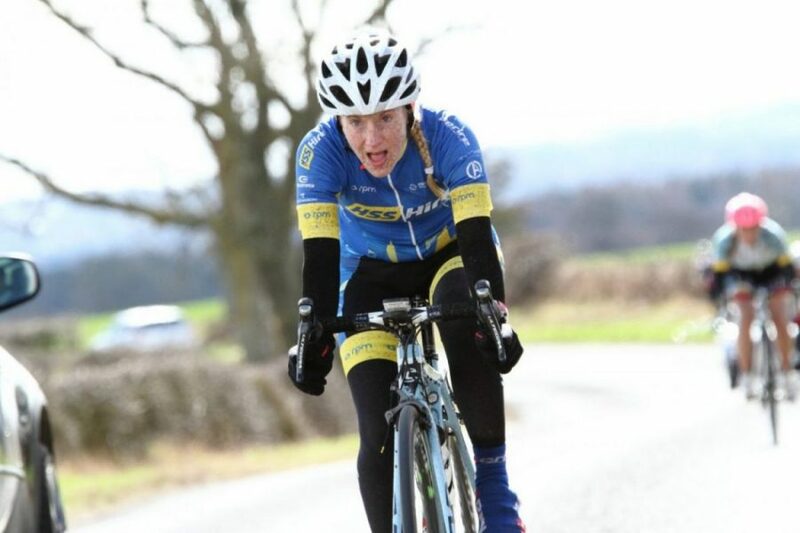 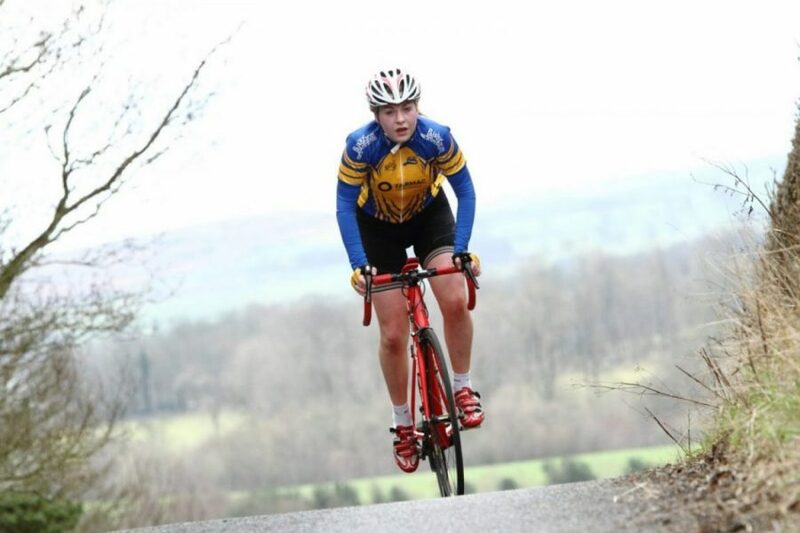 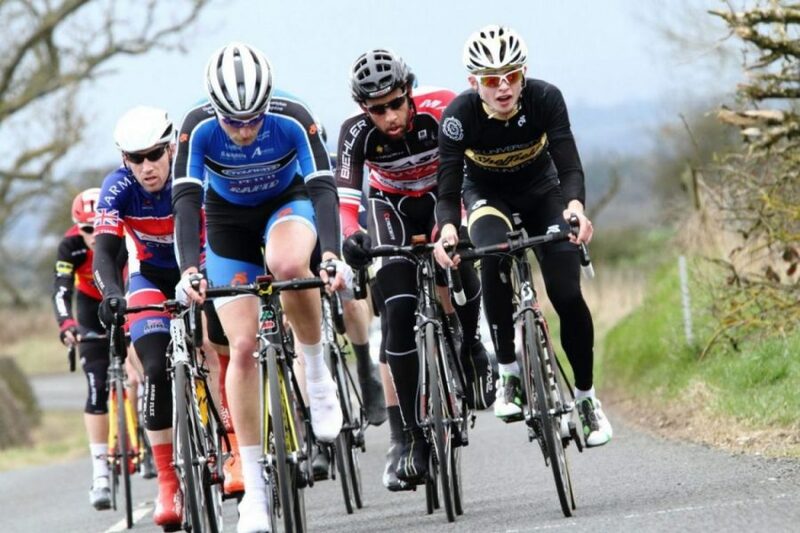 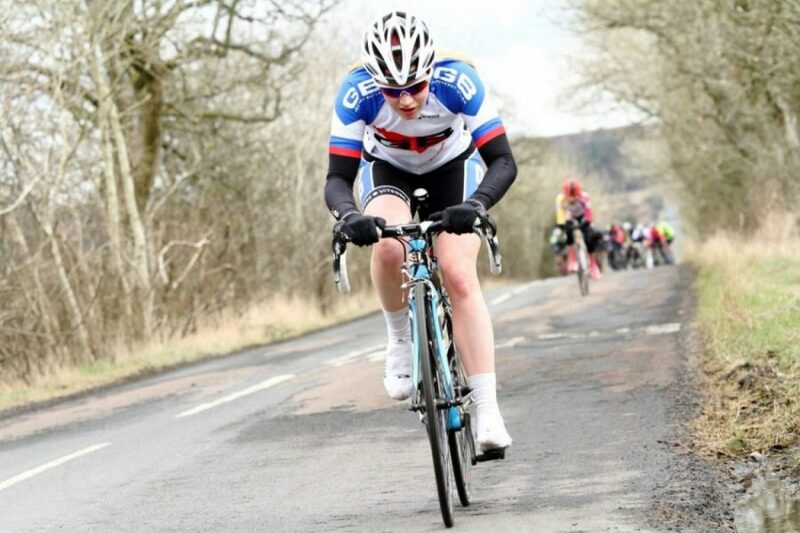 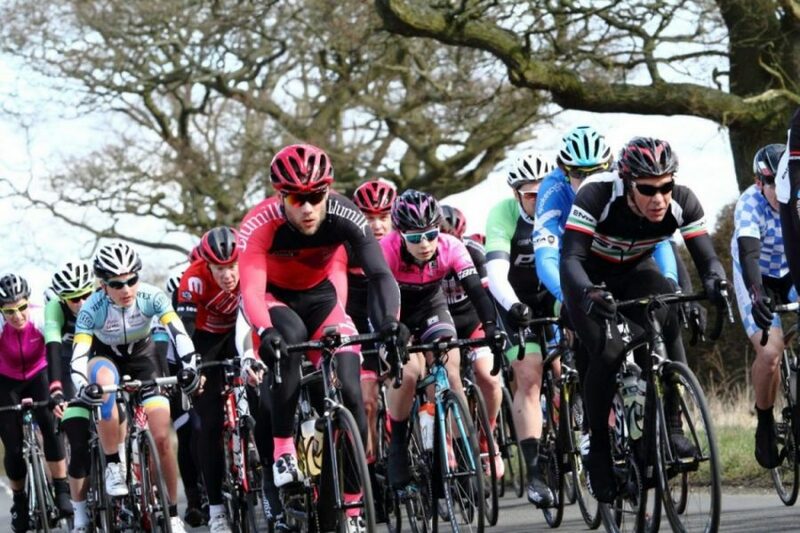 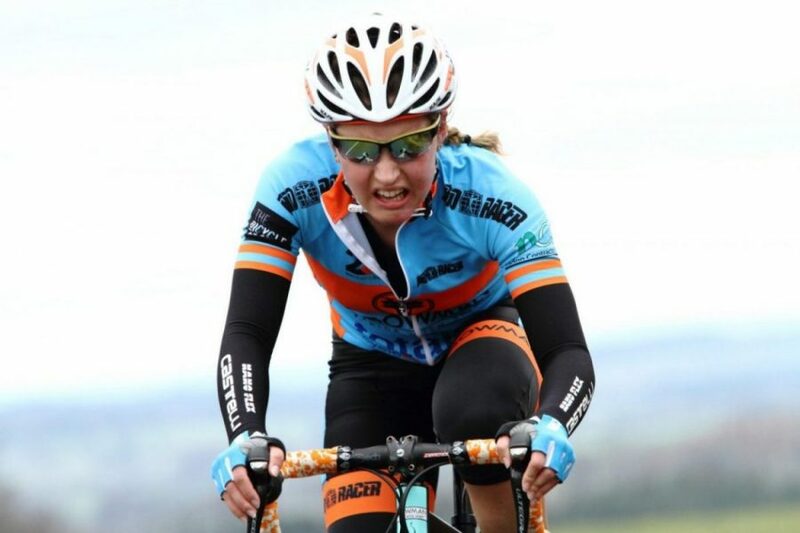 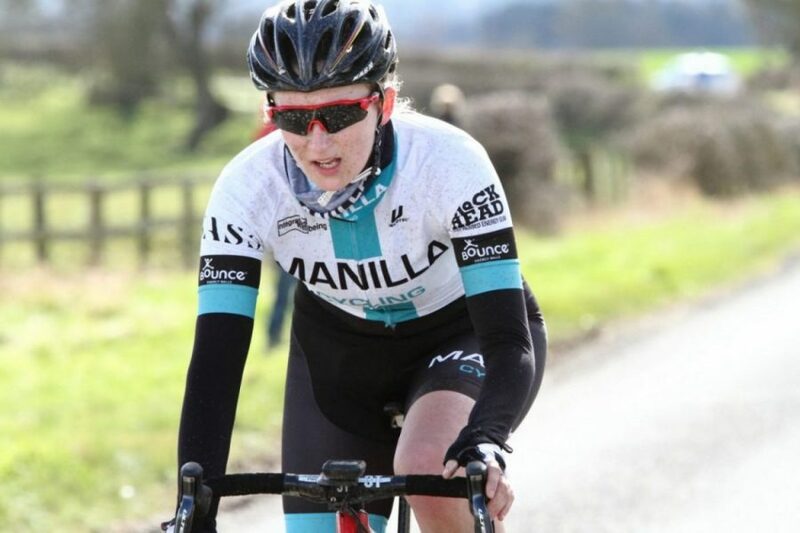 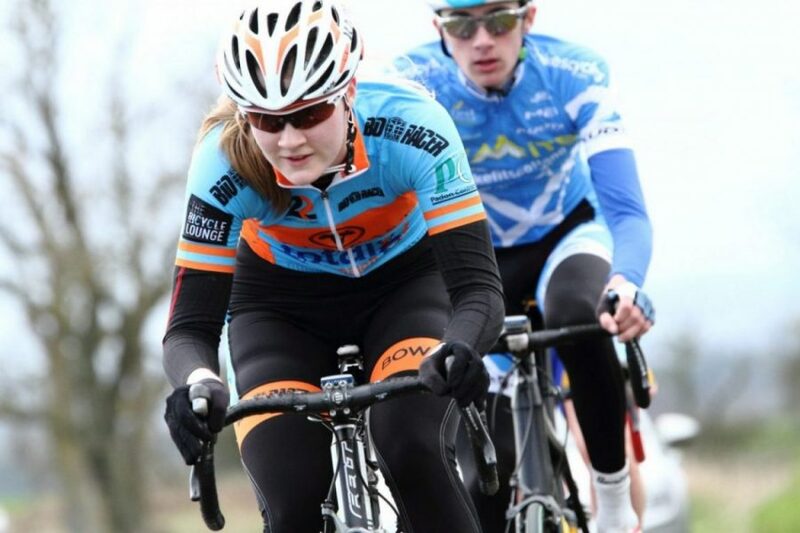 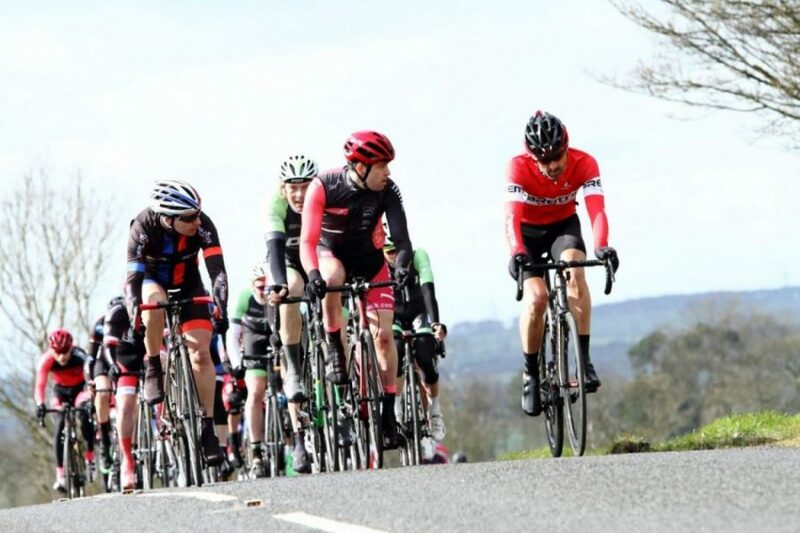 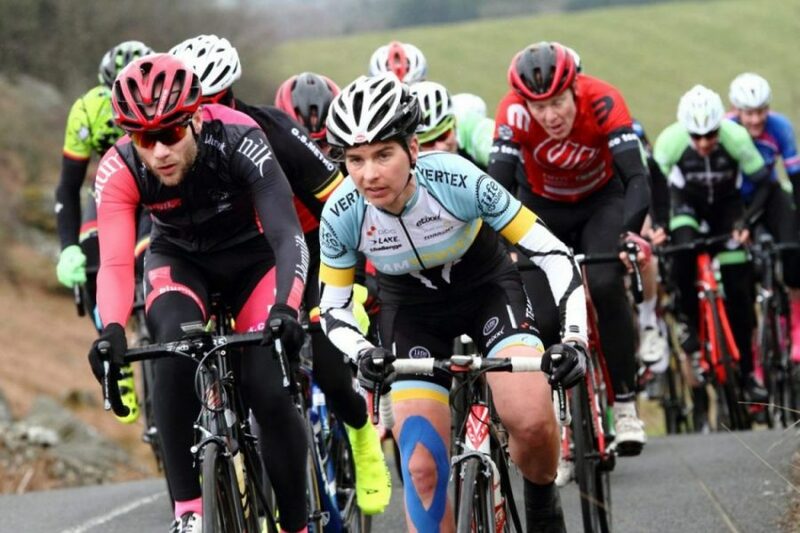 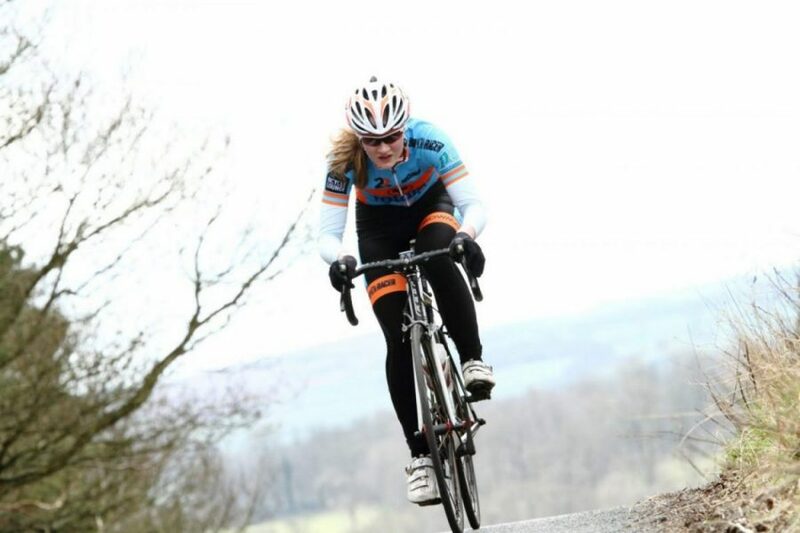 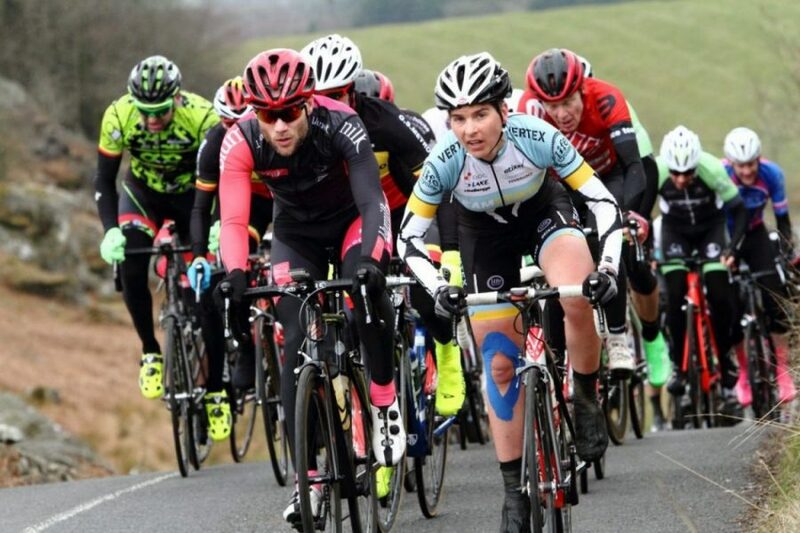 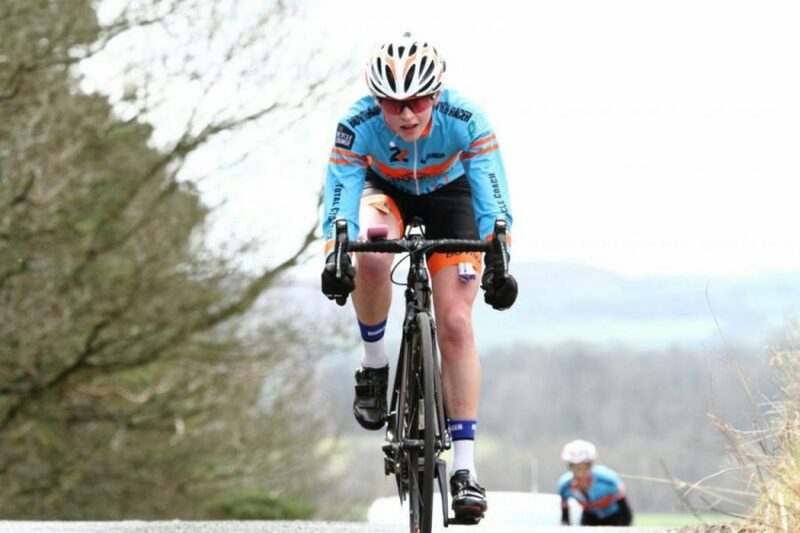 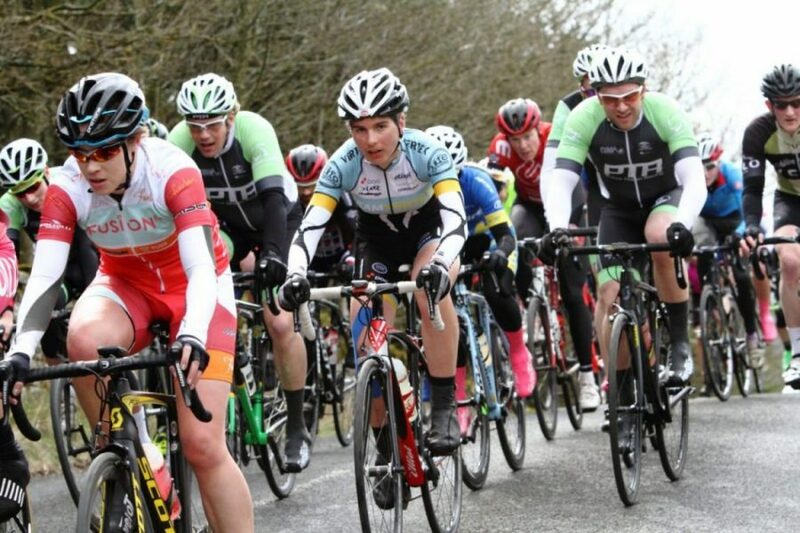 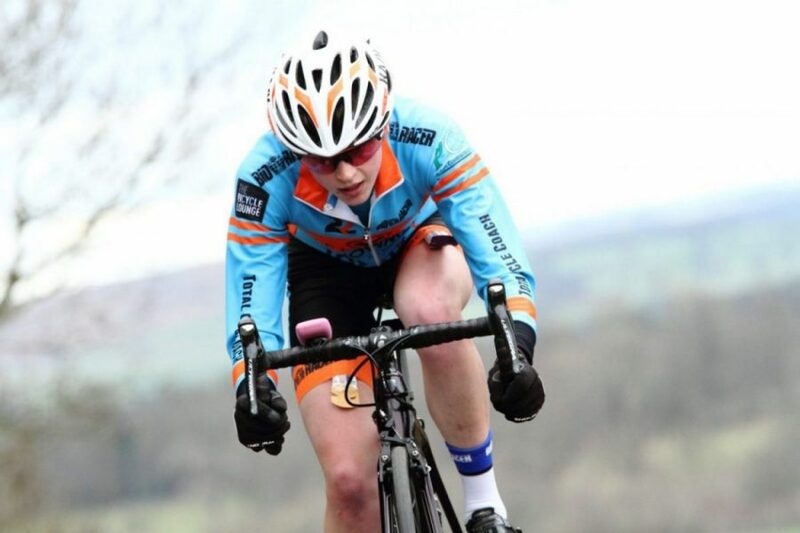 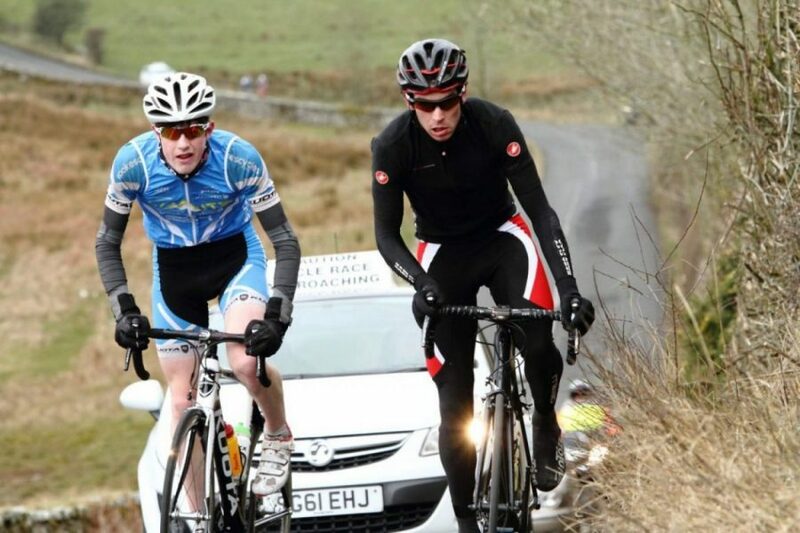 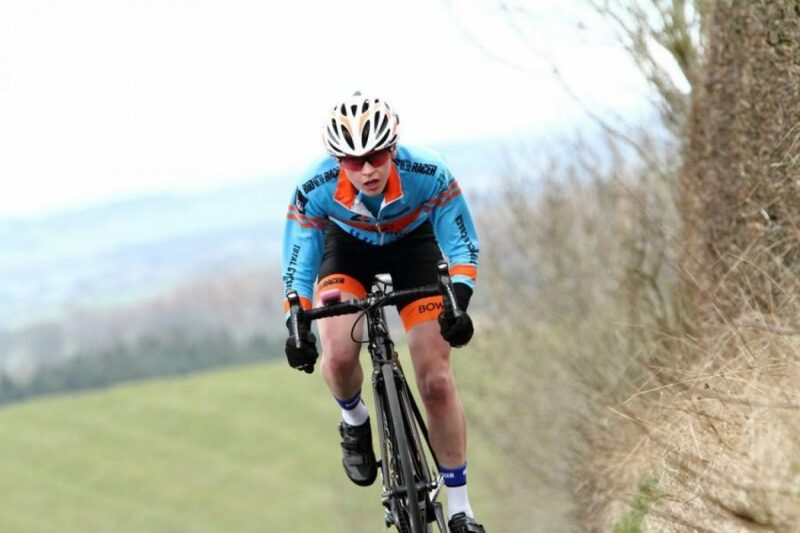 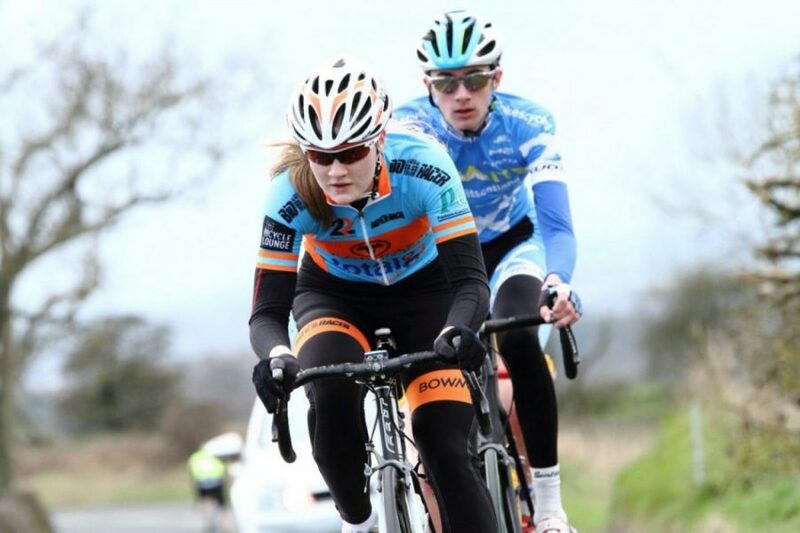 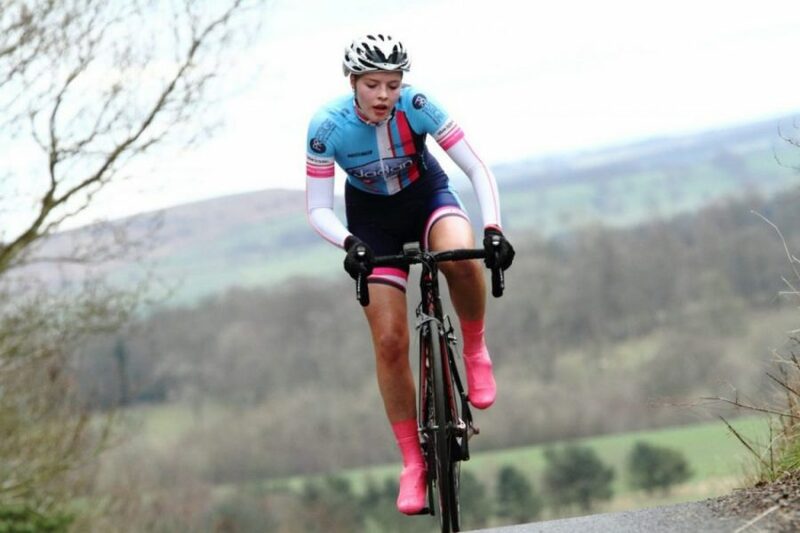 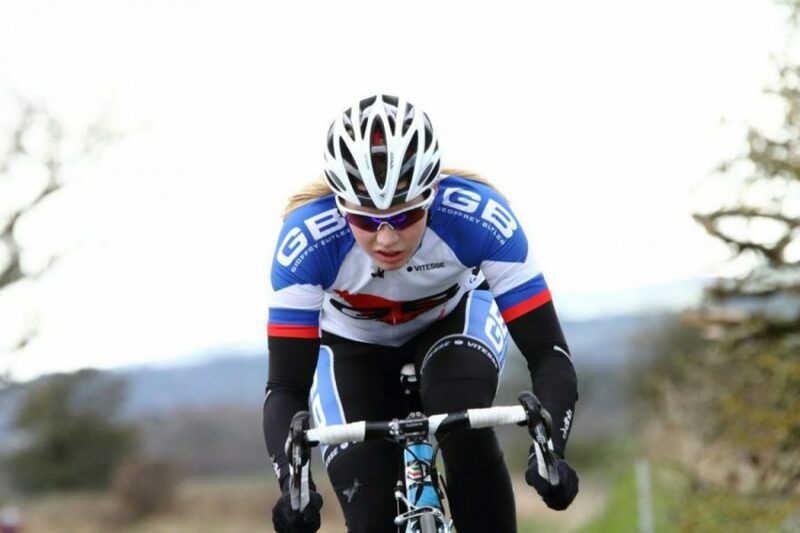 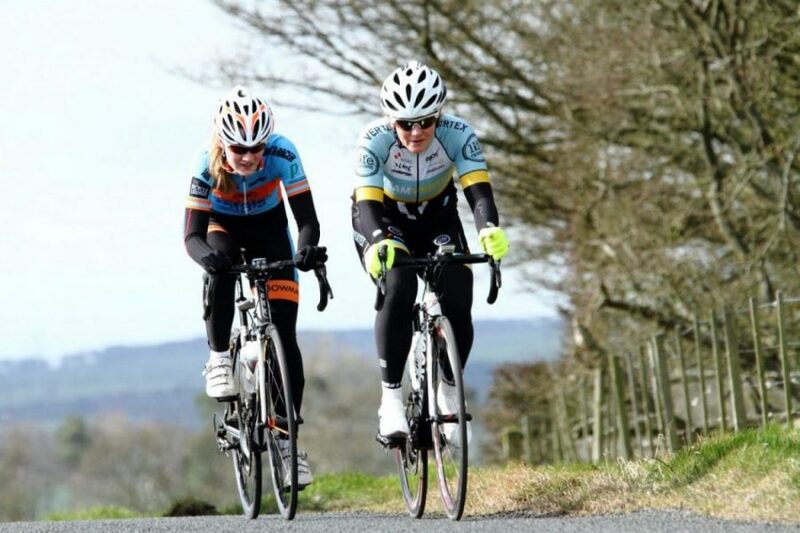 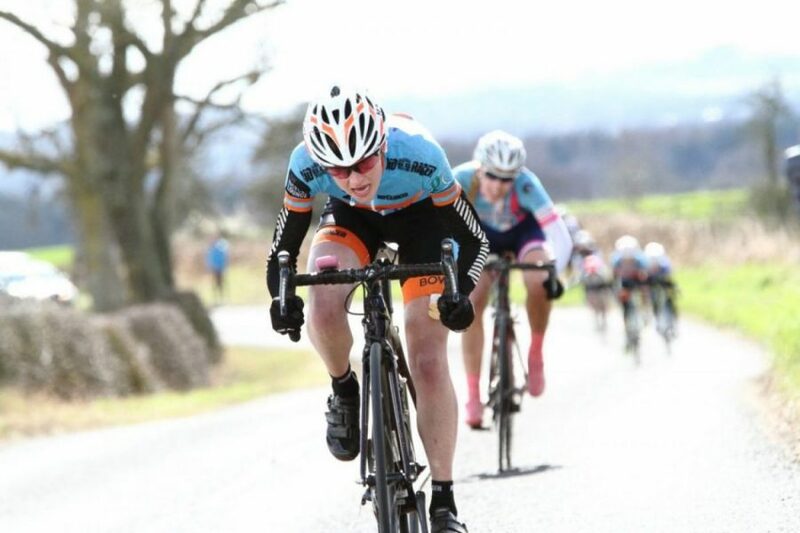 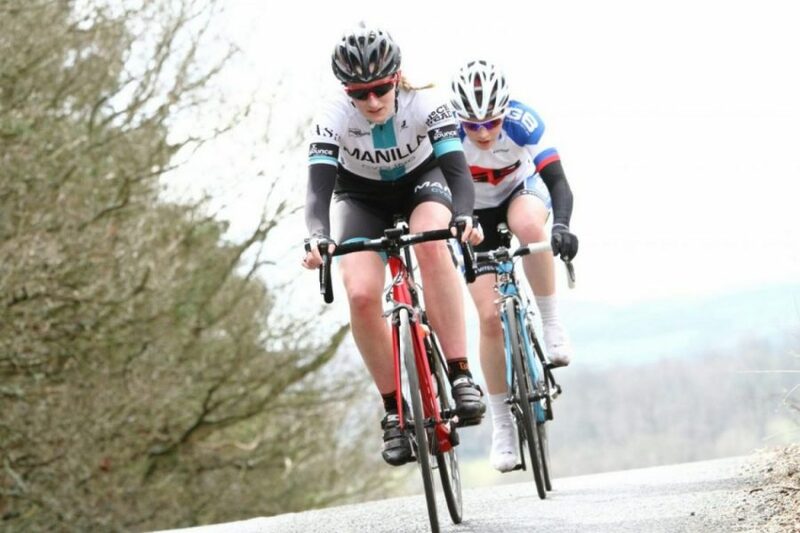 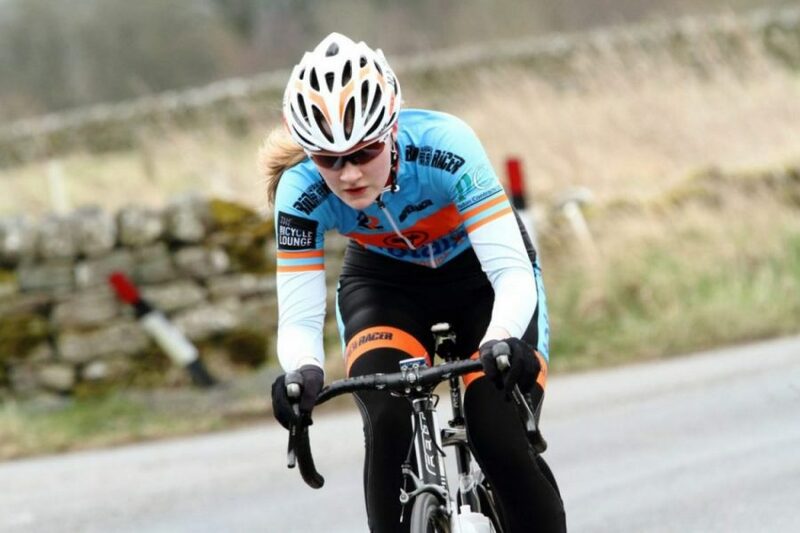 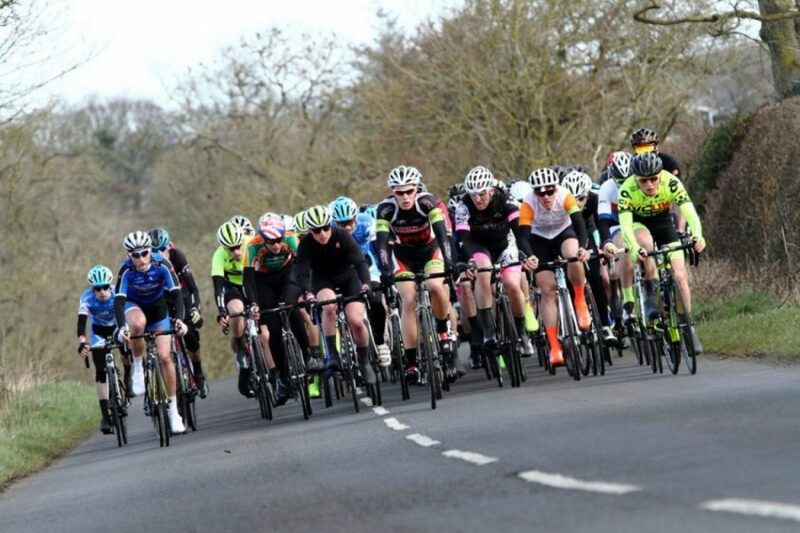 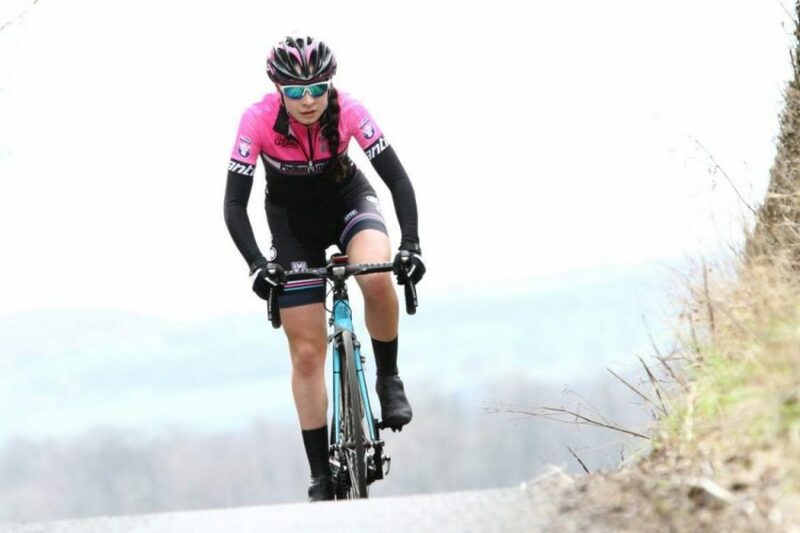 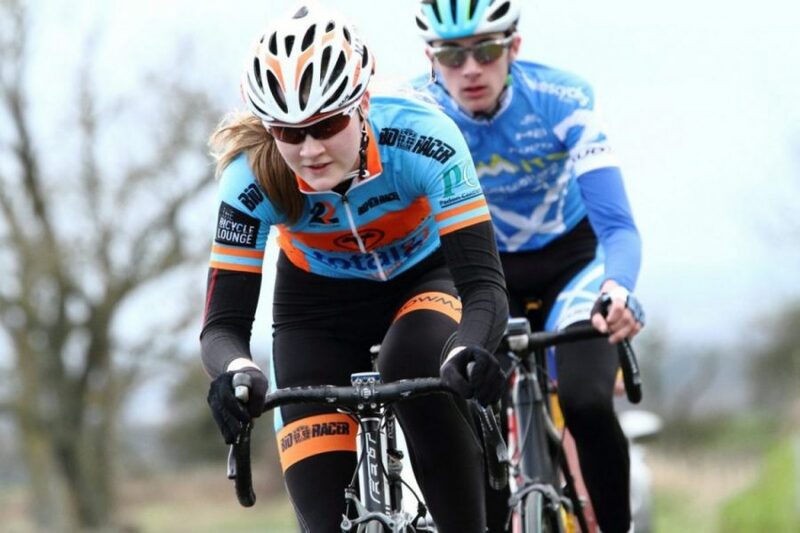 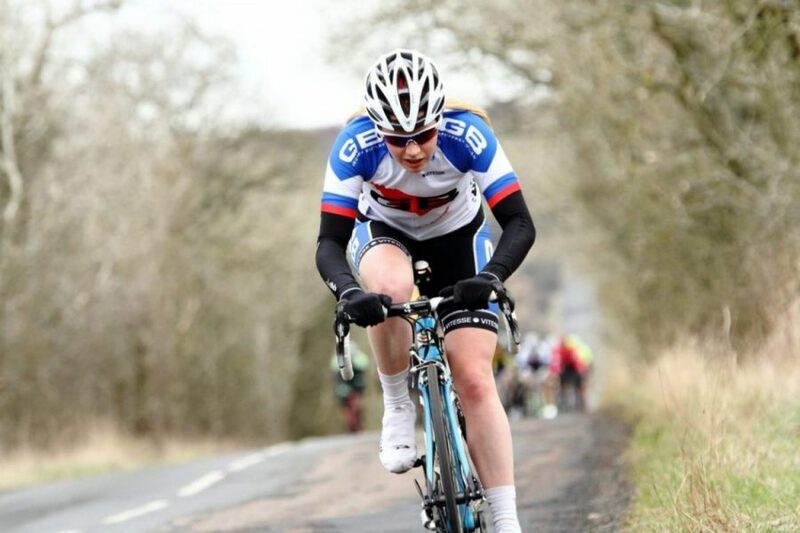 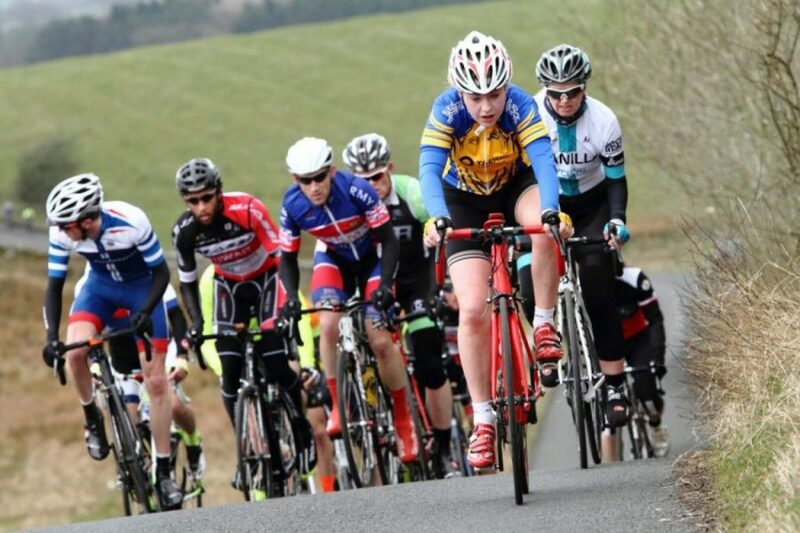 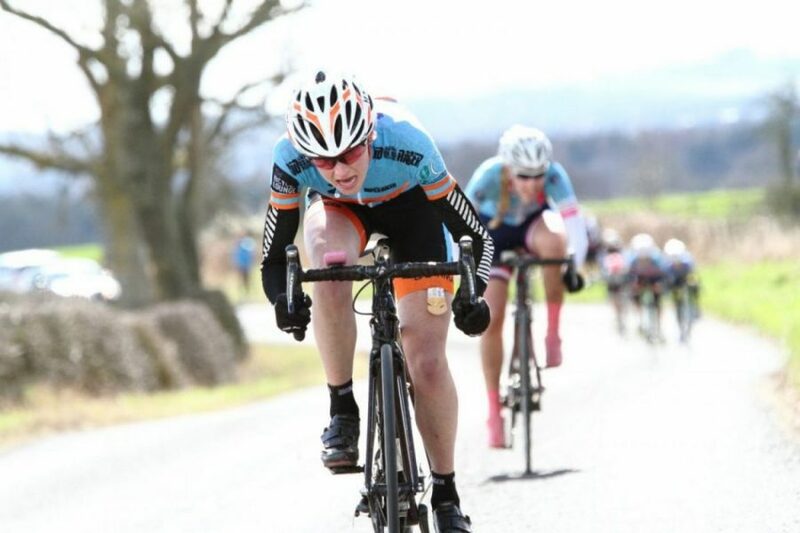 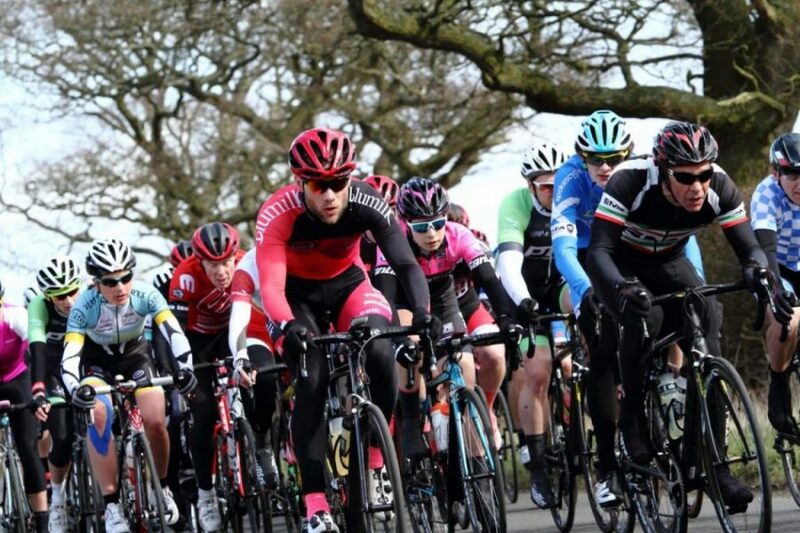 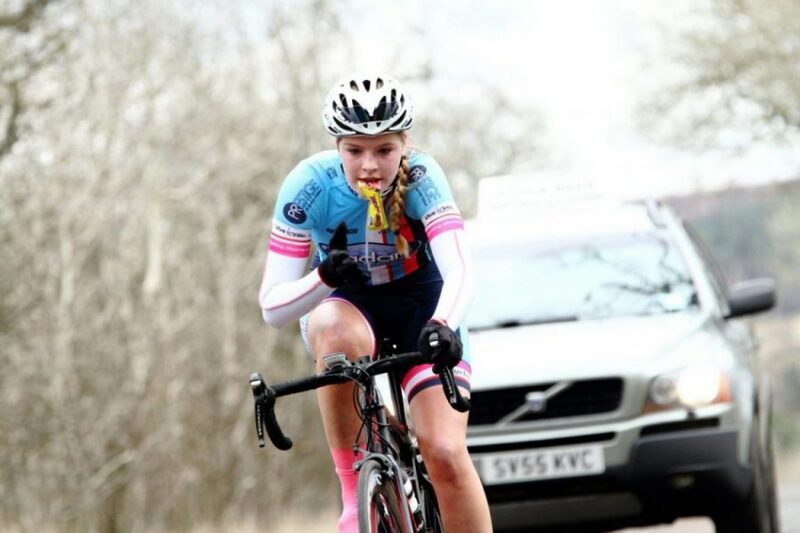 Angela will be tackling the Manx International GP Feminin Women’s Road Series Season opener, before returning to Northumberland and round two of the Women’s Road Series, the Alexandra Tour of the Reservoir. 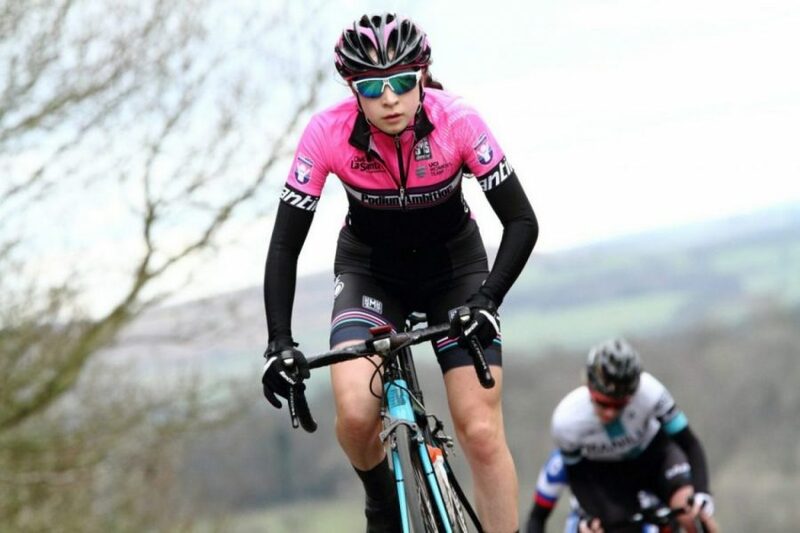 Angela Hibbs “We had a similar set-up to yesterday, there were three of us [Angela, Karen & Gemma Sargent] in the main group, but we had Gemma this time. 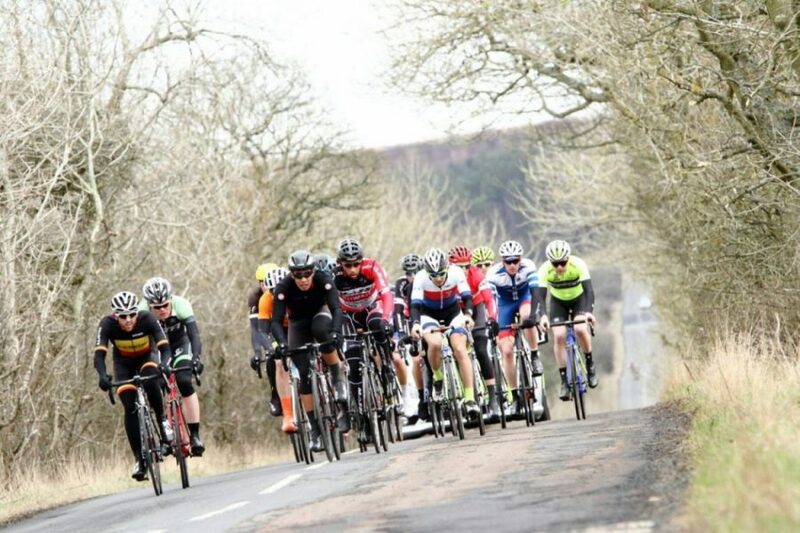 The men didn’t seem to have the power to go, and they came back straight away. 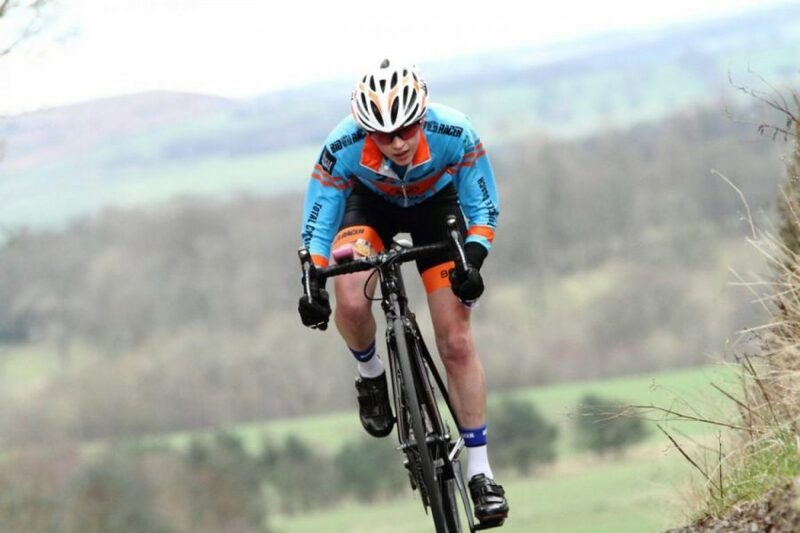 On the last lap I kind of knew when I wanted to go! 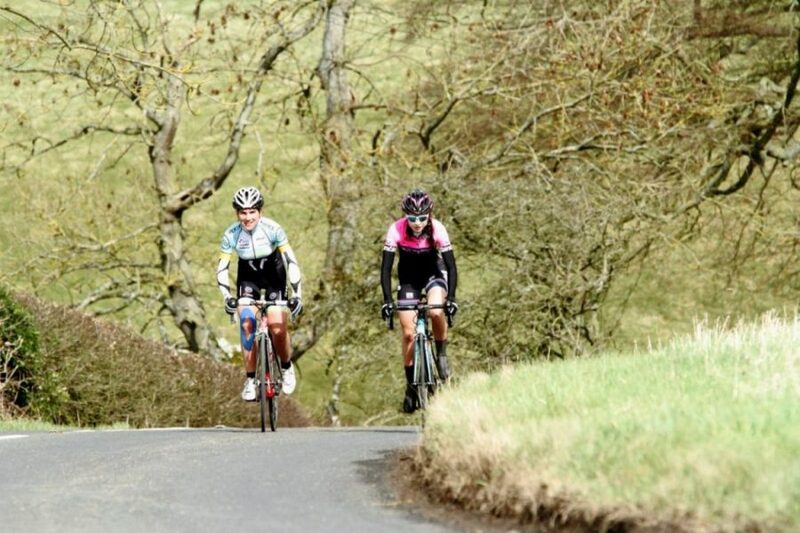 Which was after the climb and you turn left. 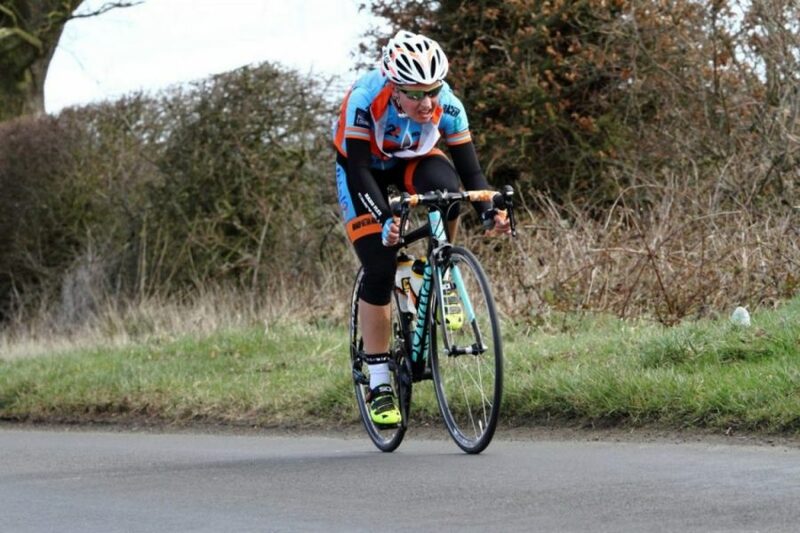 It was fast with a few up-to drags. 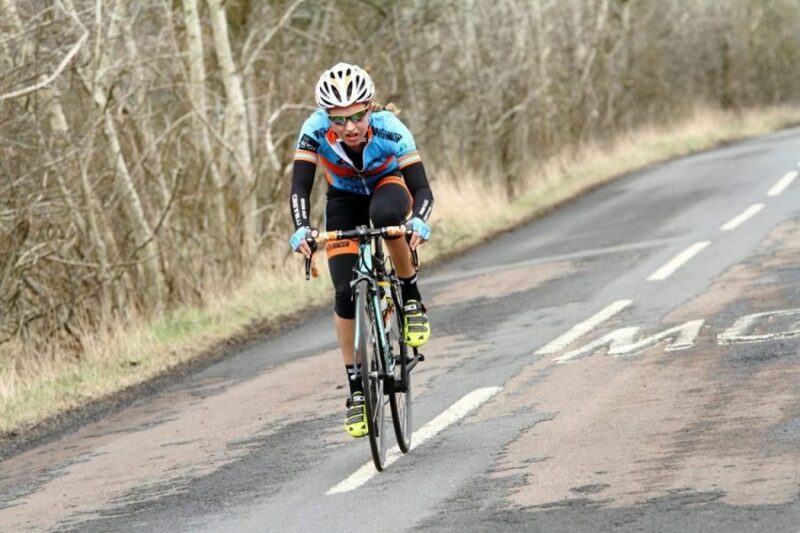 I wanted to go with a mile and a half or two miles to go, same as yesterday. 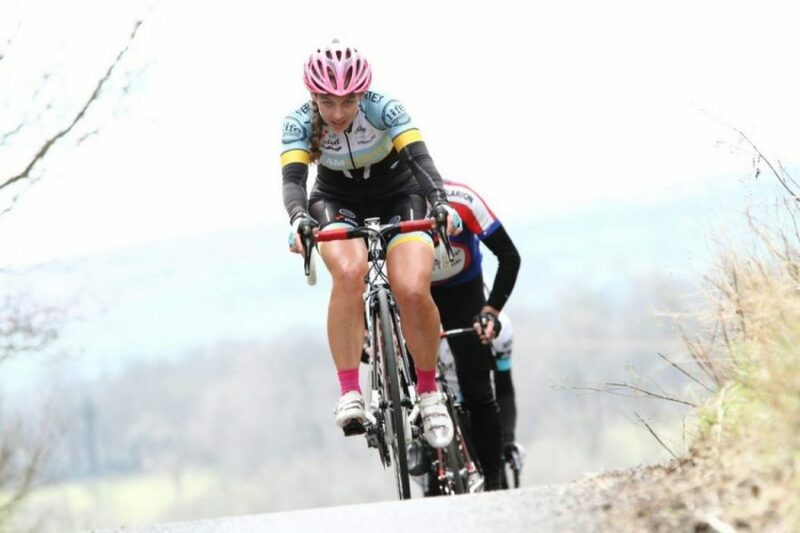 My “TT” legs felt good and I wanted to avoid the sprints, so I just went hard”. 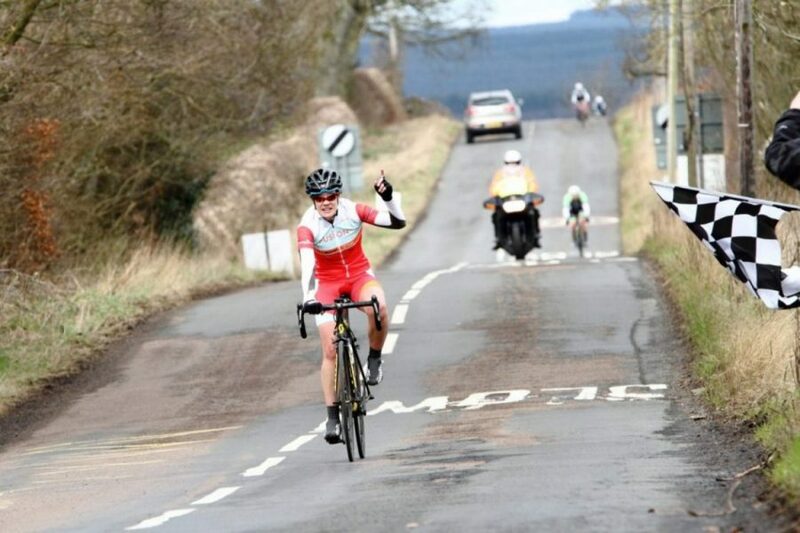 “I’m dead chuffed” said Angela afterwards. 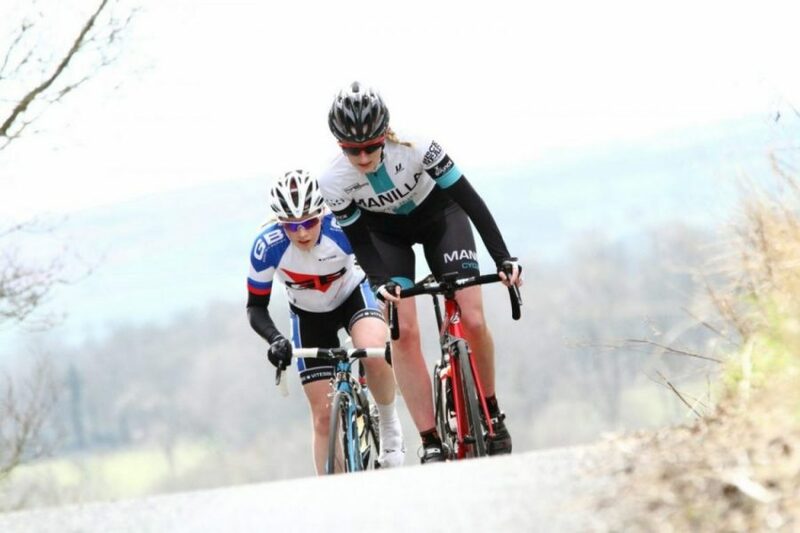 “I’m doing the Isle of Man in two weeks and the Tour of the Reservoir after that”. 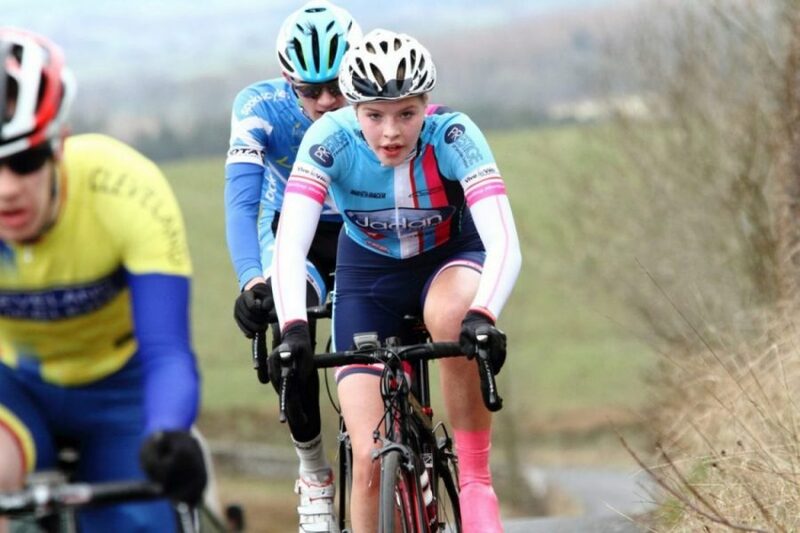 A great effort by Team Jadan Weldtite’s Sarah Bradford in race two sticking with the main bunch until a mechanical on the second lap climb, when her chain dropped hampering her progress. 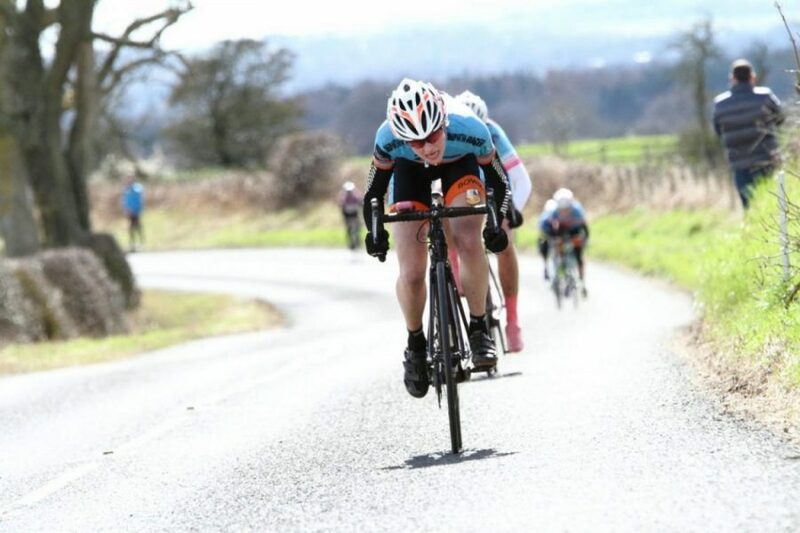 Quickly getting going, Sarah found a difficult head wind and her lower gearing working against her in her effort to catch the main bunch, eventually settling into a small group until the end. 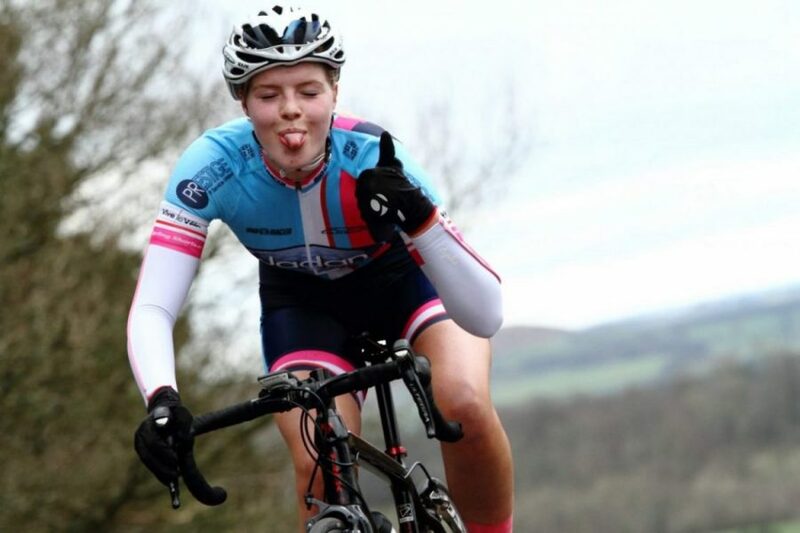 “That was fun” she chuckled heading back to HQ after the race. 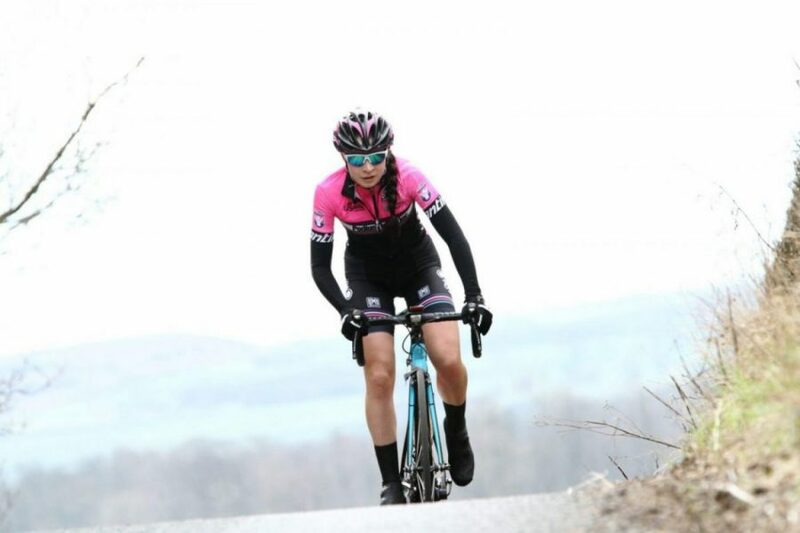 Sarah had hoped for the weather to deteriorate a little, saying the she preferred slightly harsher conditions. 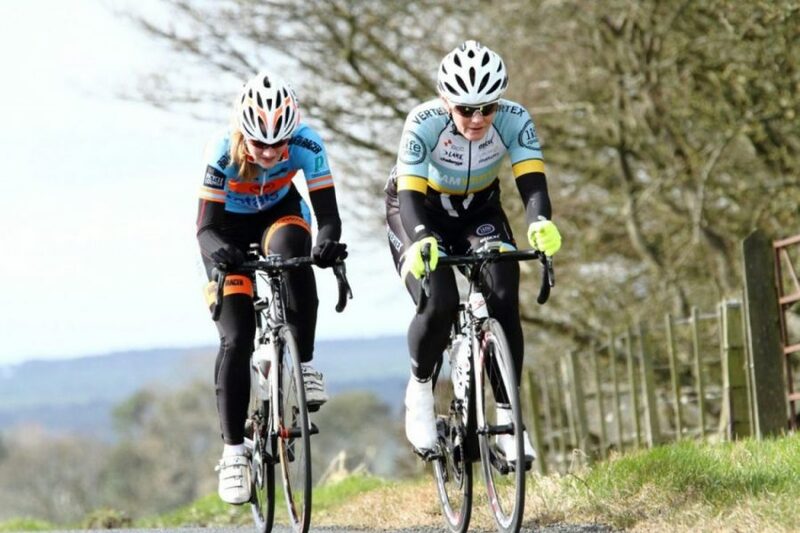 A good ride by the Team22WRT girls completing the two day event with some good miles in their legs, and practice for the Alexandra Women’s Tour of the Reservoir just along the road in a couple of weeks. 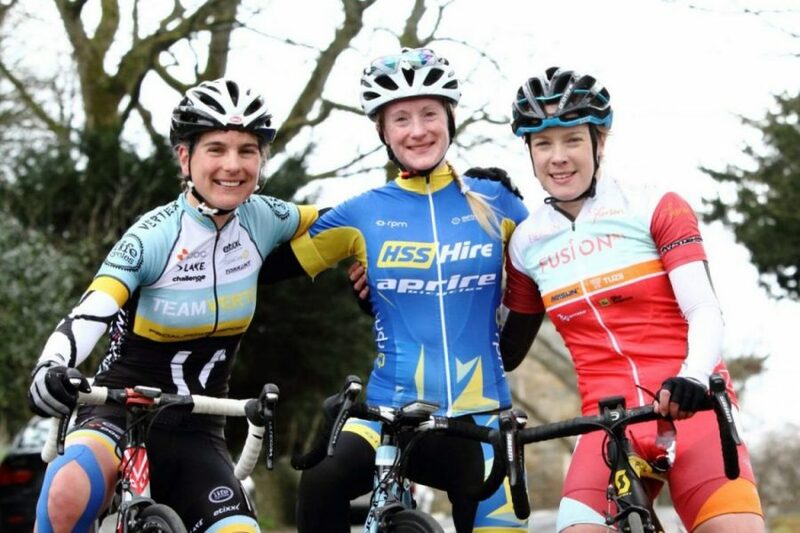 That race has a full Women’s field and is part of the 2016 Women’s Road Series. 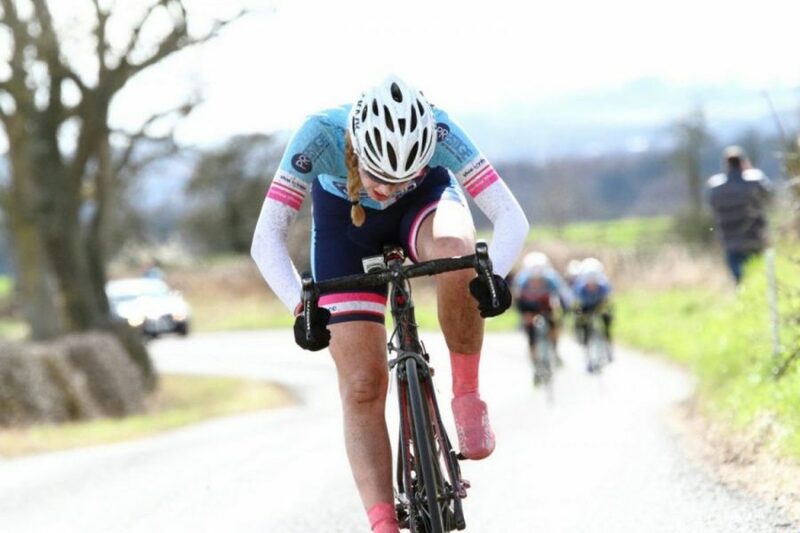 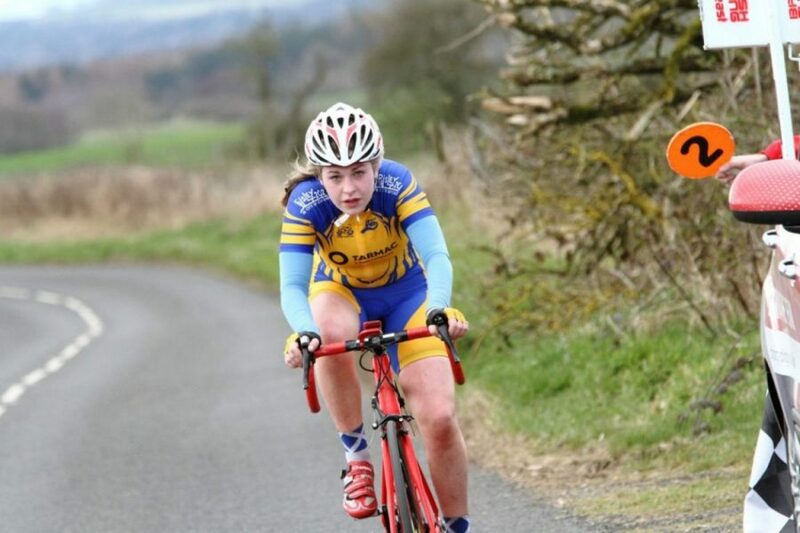 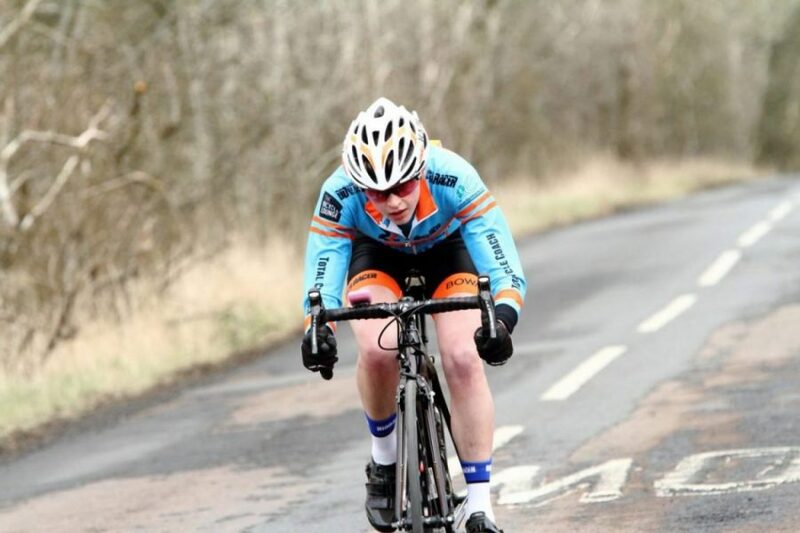 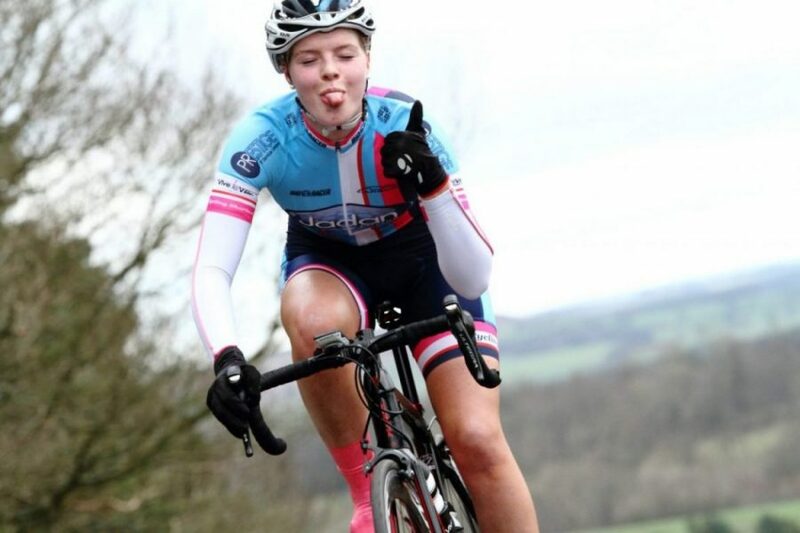 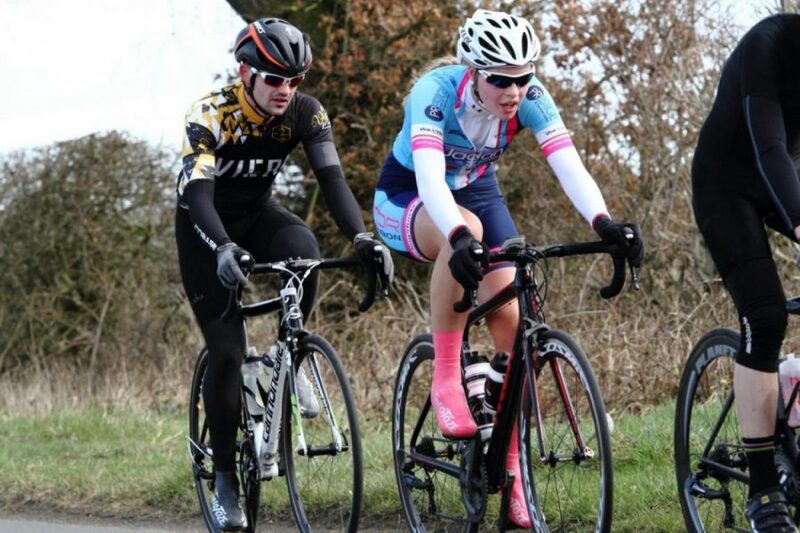 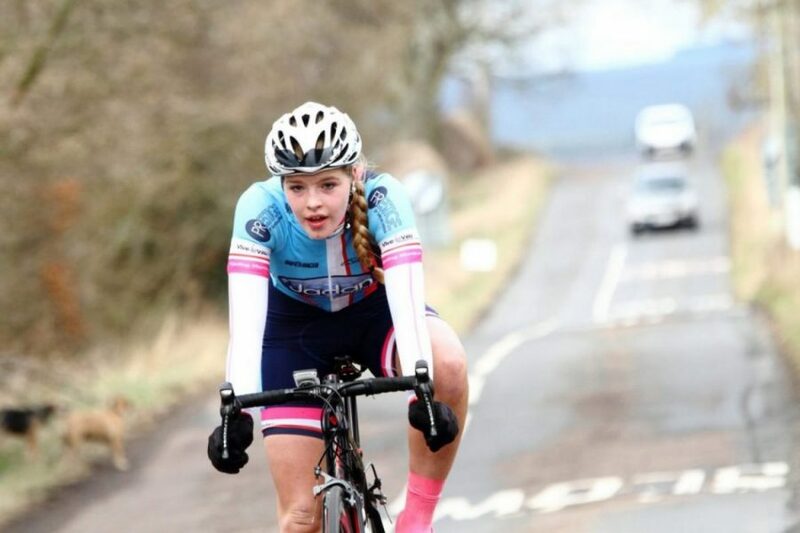 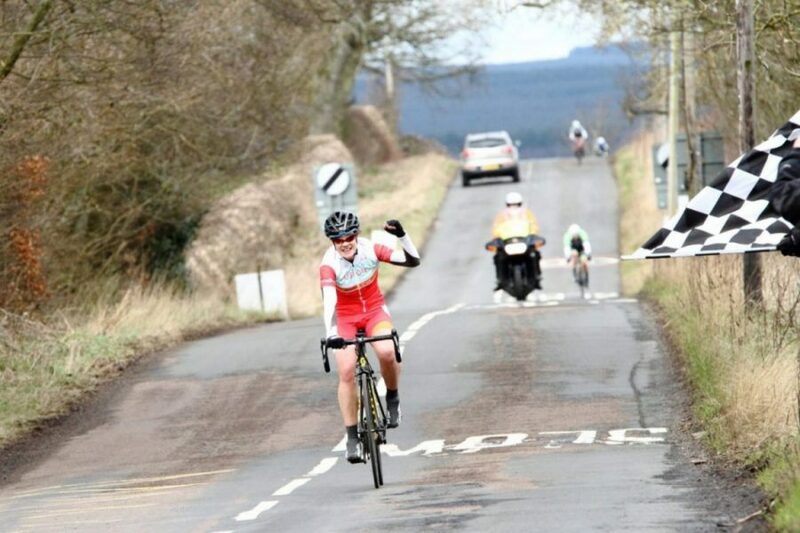 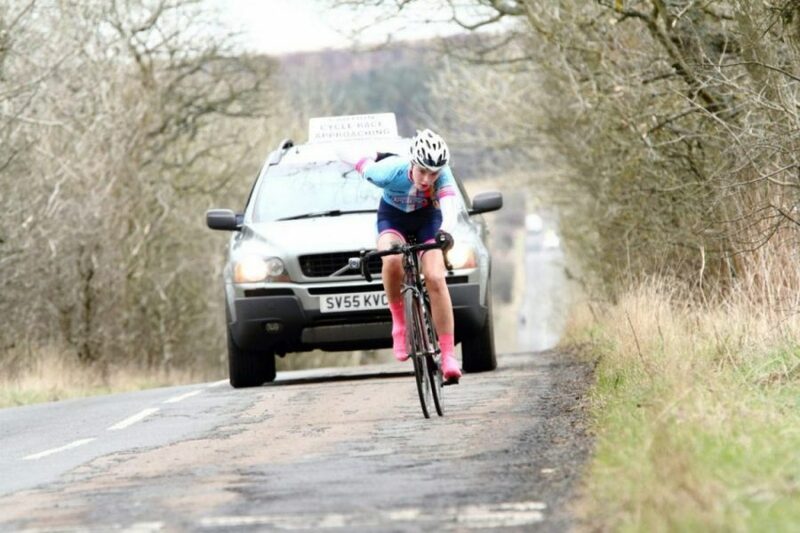 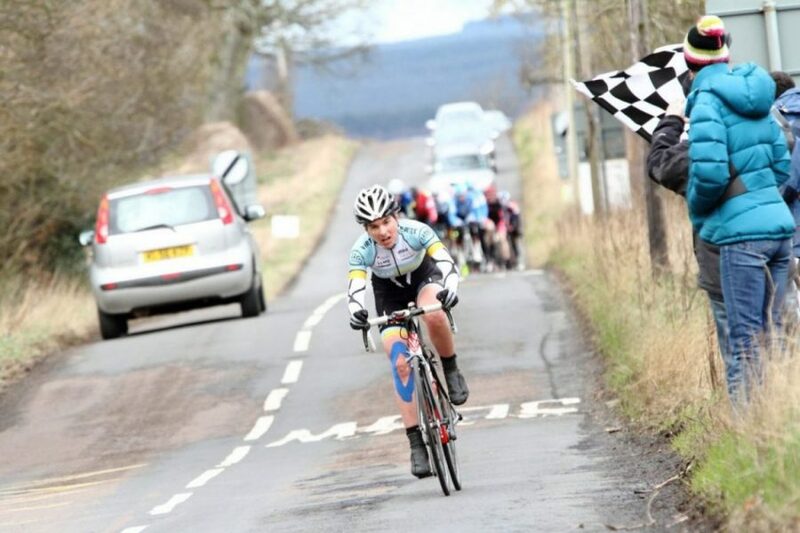 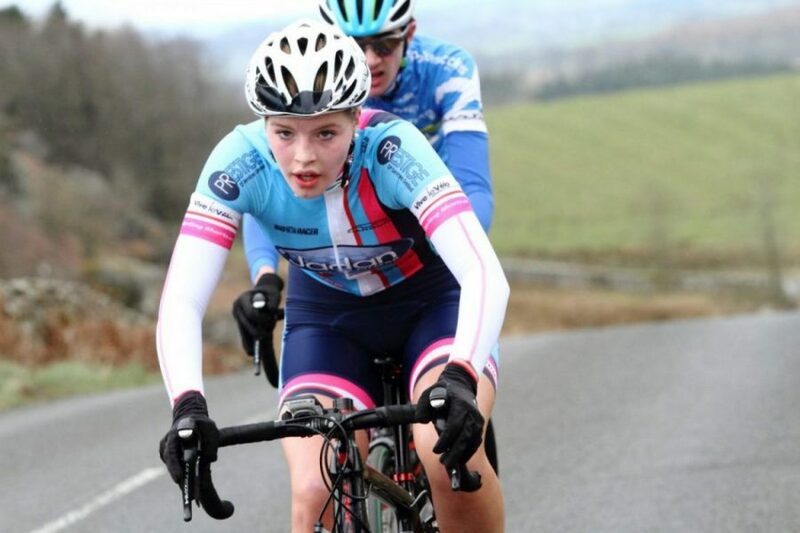 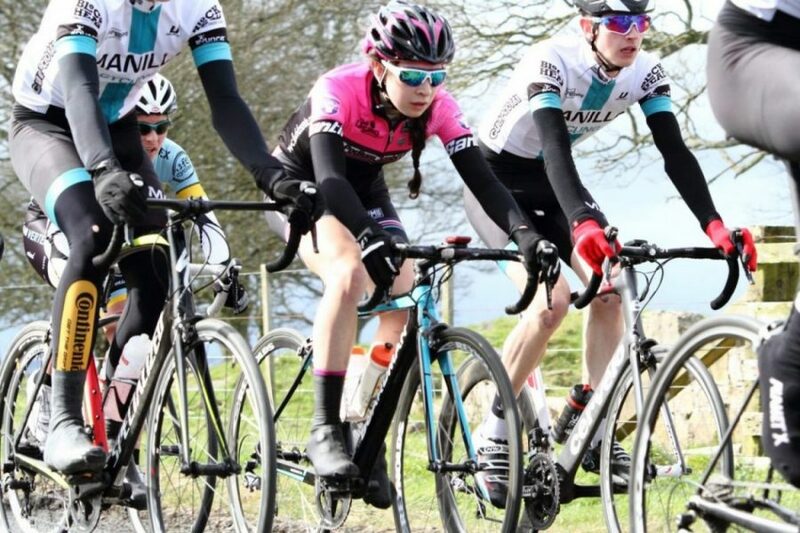 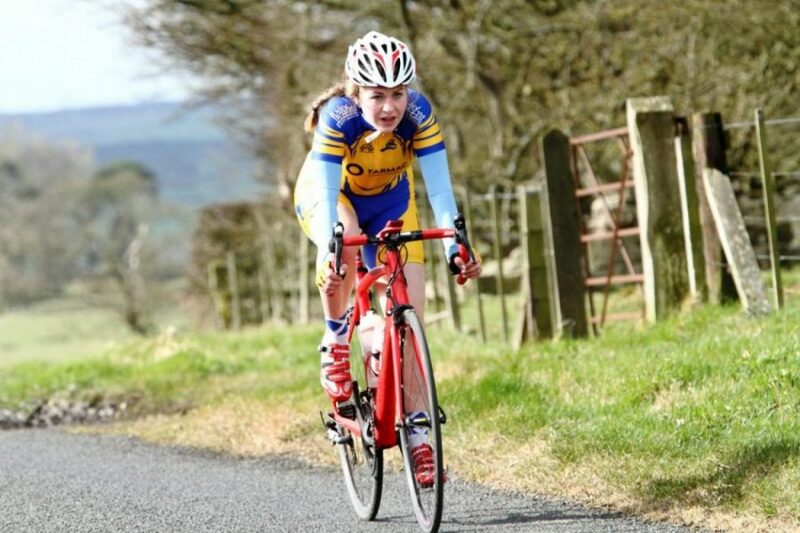 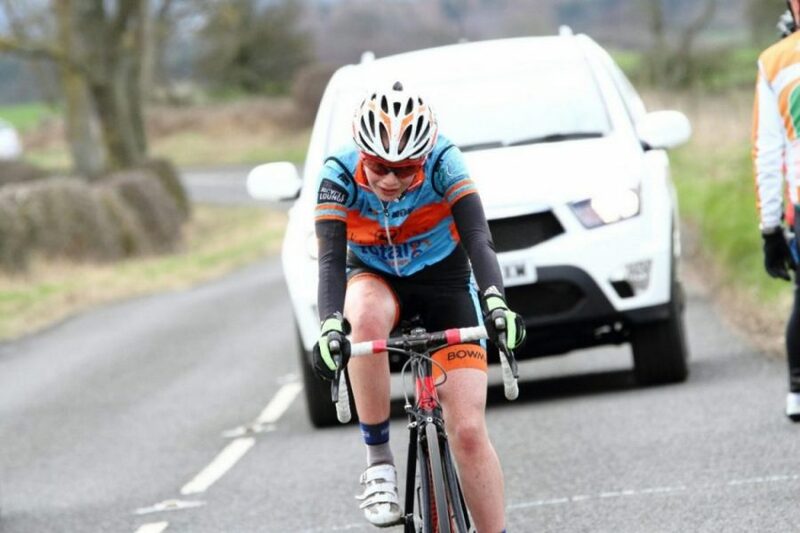 A great ride by Johnstone Wheelers CC Jess Millar completing her first big race, gaining valuable experience on this demanding course so early in the Season. 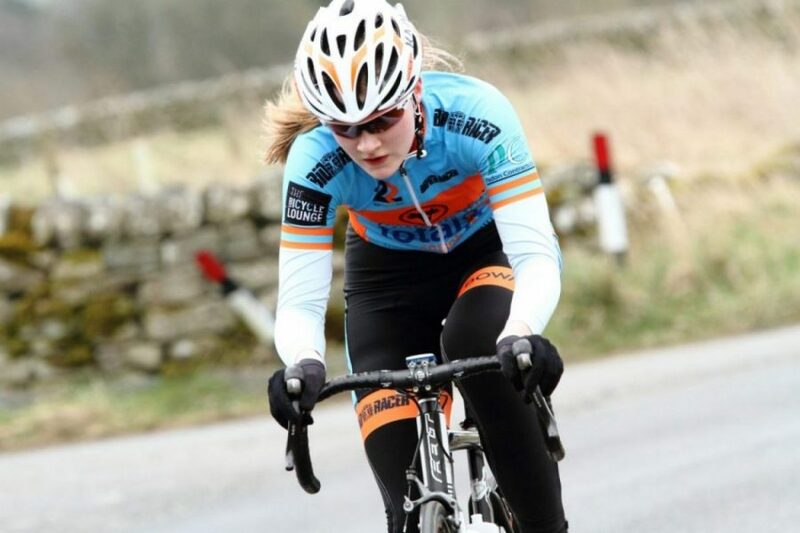 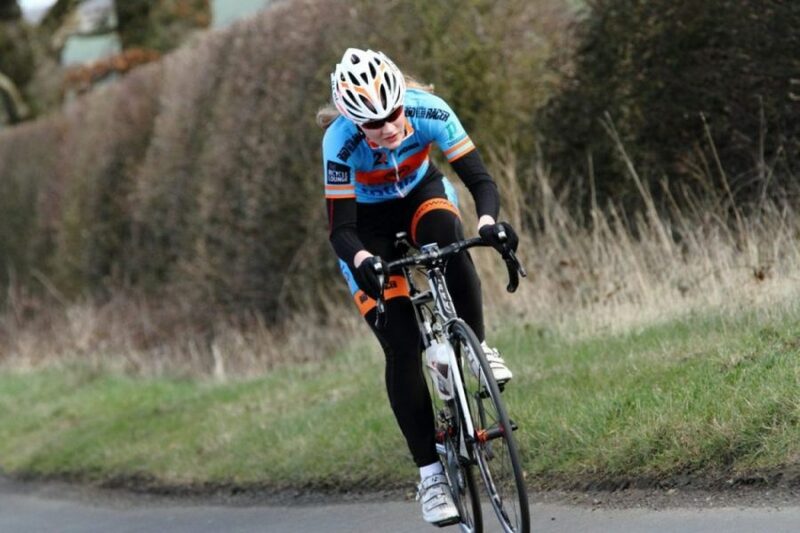 Jess has also signed up for the Alexandra Women’s Tour of the Reservoir too!